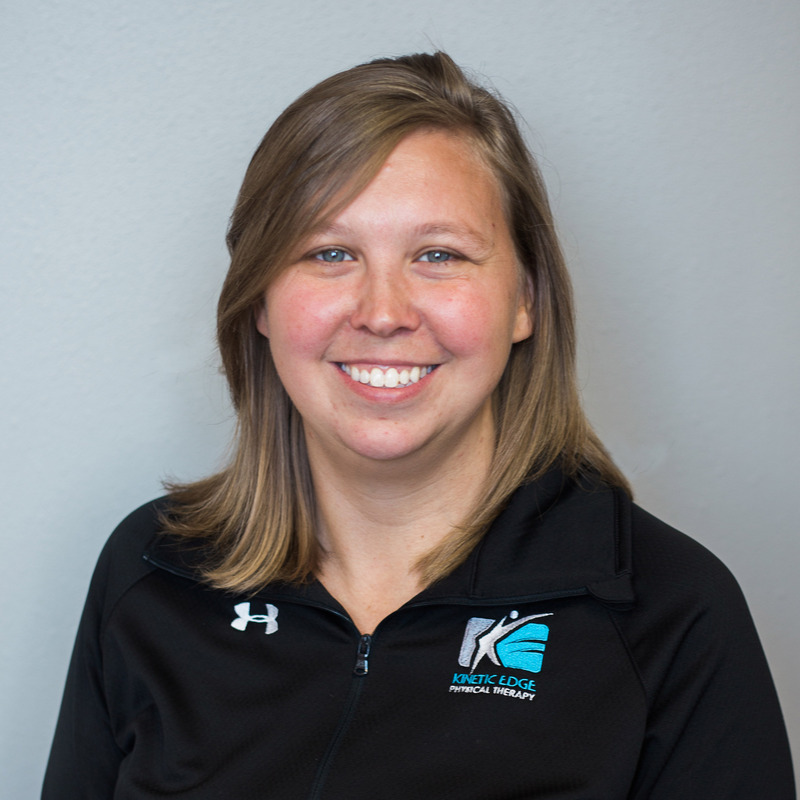 Elise Spronk joined Kinetic Edge Physical Therapy in 2006. She is an occupational therapist who specializes in pediatrics and hand therapy and is a partner of the company. Her mission at Kinetic Edge is to provide hope and help to her clients through therapy sessions that are meaningful and fun (especially for the kids). Elise earned her master’s degree in occupational therapy from the University of South Dakota in 1997. She is also certified by Norton School of Lymphatic Therapy as a Lymphedema Specialist. Elise and her husband Scott live in Pella with their two sons and five fish. 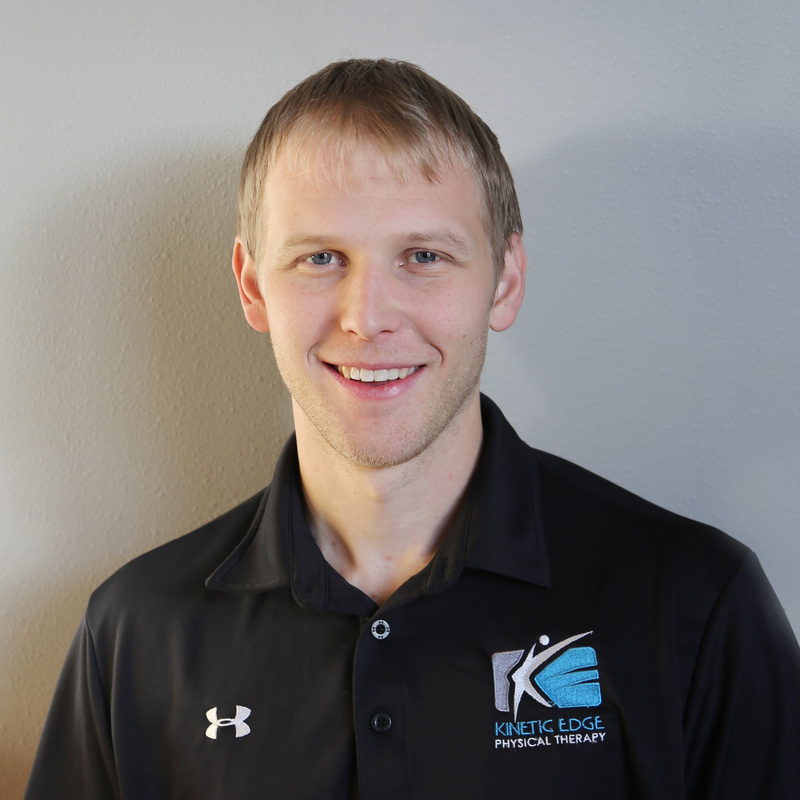 Dustin Briggs is the Health and Injury Management and Prevention Coordinator at Kinetic Edge Physical Therapy. 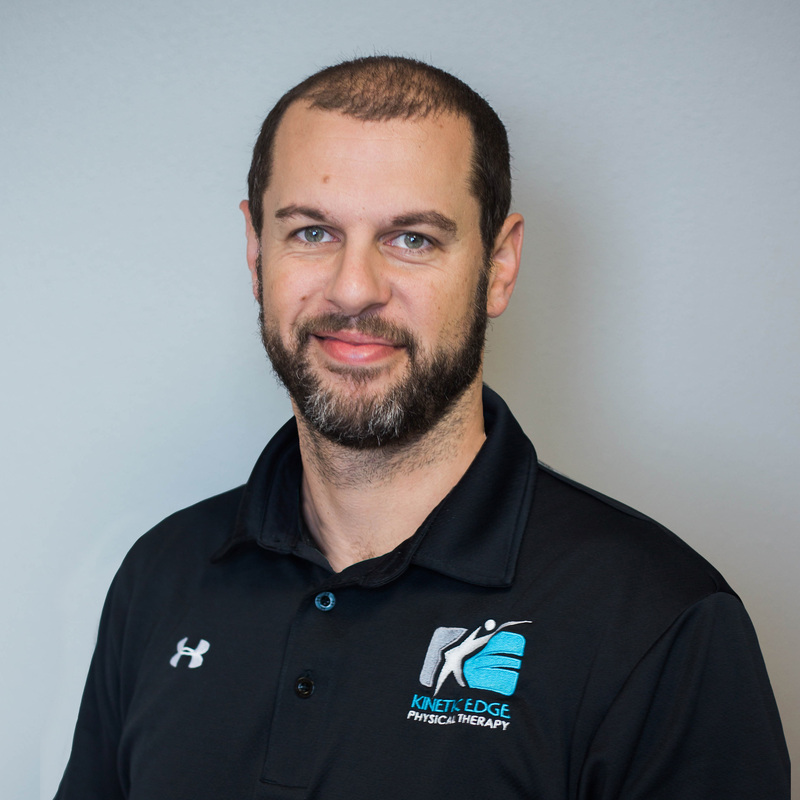 At Kinetic Edge, Dustin helps with athletic training coordination, pre-work screens, 3M onsite injury management, and medical fitness program. 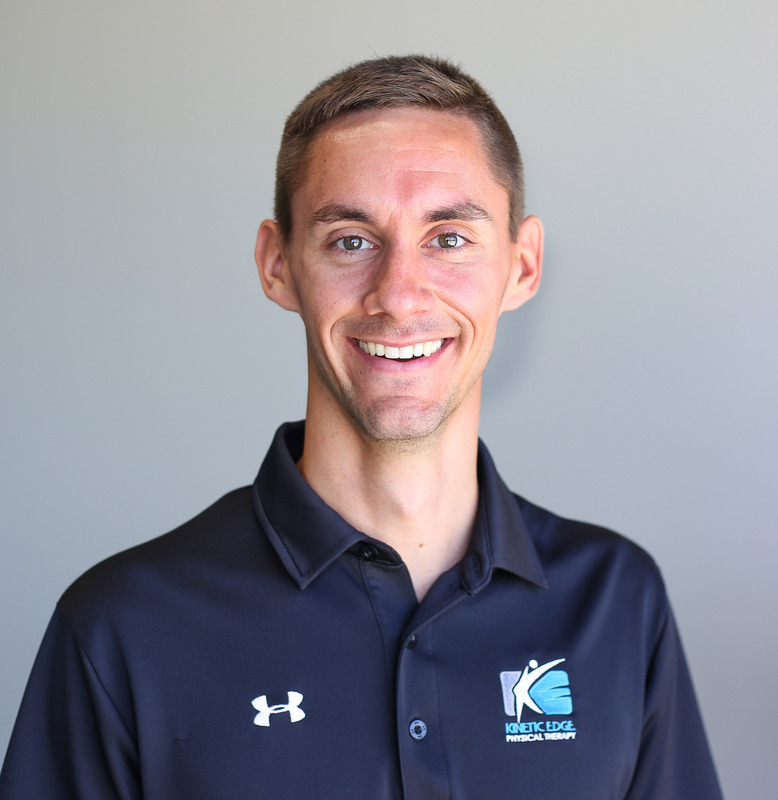 His mission for working at Kinetic Edge is to provide thoughtful evidence-based and movement-based care for clients in the workplace and in the area high schools. 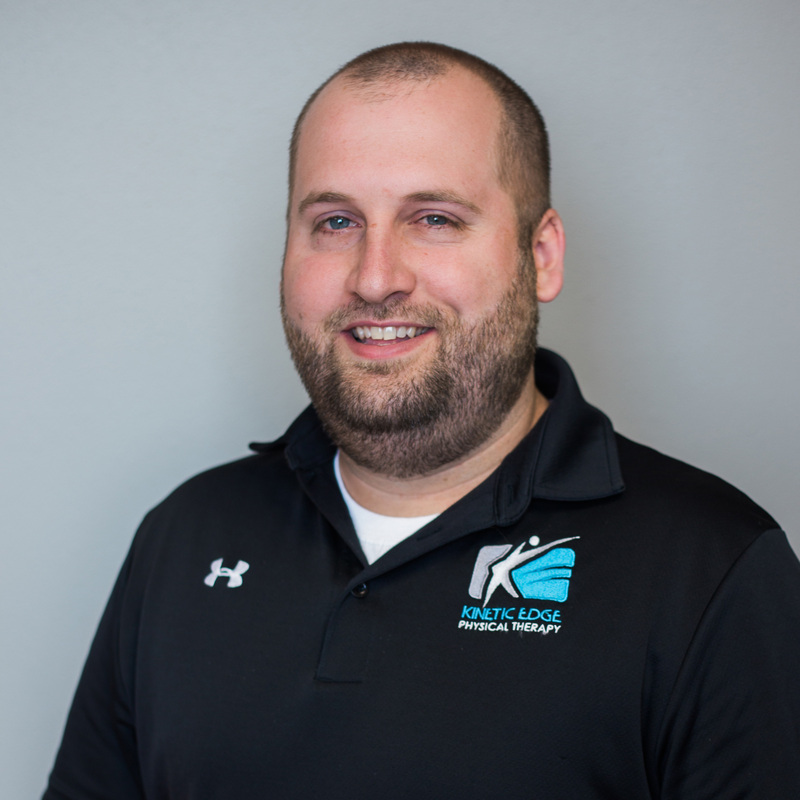 Dustin earned his master’s degree in athletic training from the University of Kentucky after earning his bachelors in athletic training from the University of Northern Iowa. He is also the Iowa Athletic Trainers’ Society president and ambulance director for New Sharon, Iowa. This lifelong learner and advocate of the profession has also served as a college instructor for seven years. Dustin and his wife Alisha have two kids and two dogs and live in New Sharon. 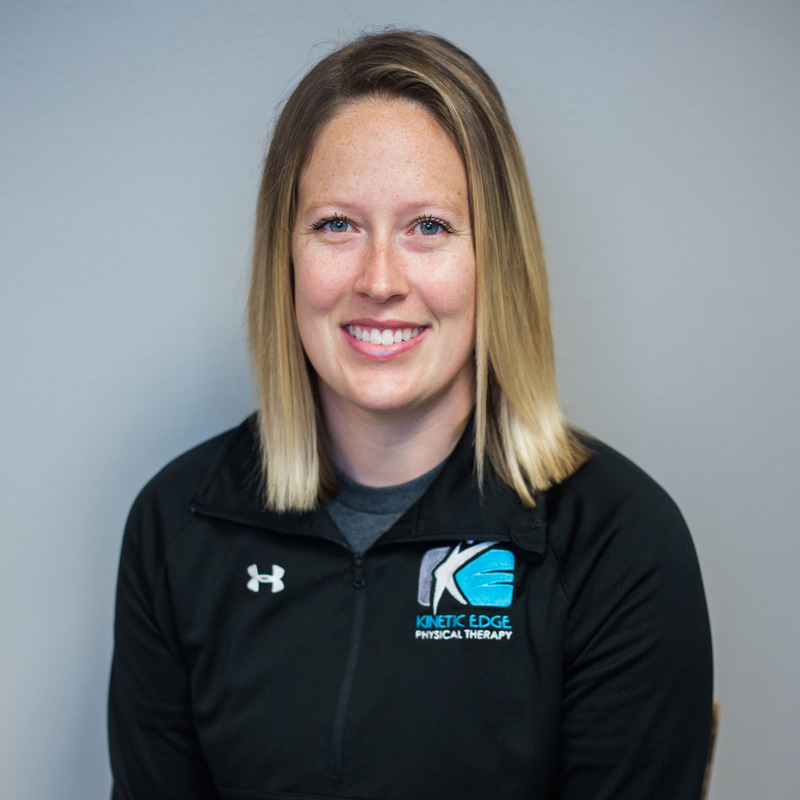 Ashley Beekman serves as the athletic trainer for Pella Christian High School on behalf of Kinetic Edge and assists with occupational therapy clients. Ashley also administers pre-work screens and drug screens and works with clients in the medical fitness program. Her mission is to provide servant-hearted care for those who have health care needs. This Fulton, Illinois native moved to Pella to attend Central College where she received her Bachelor’s degree in athletic training. She went on to earn her Certified Occupational Therapy Assistant degree from Indian Hills before joining the Kinetic Edge team in 2014. Ashley lives in Pella with her husband, Spencer, and their two corgi dogs, Wrigley and Remi. Celebrity she hopes will come to Kinetic Edge: Carrie Underwood so we could become great friends and then she could sing at my wedding. 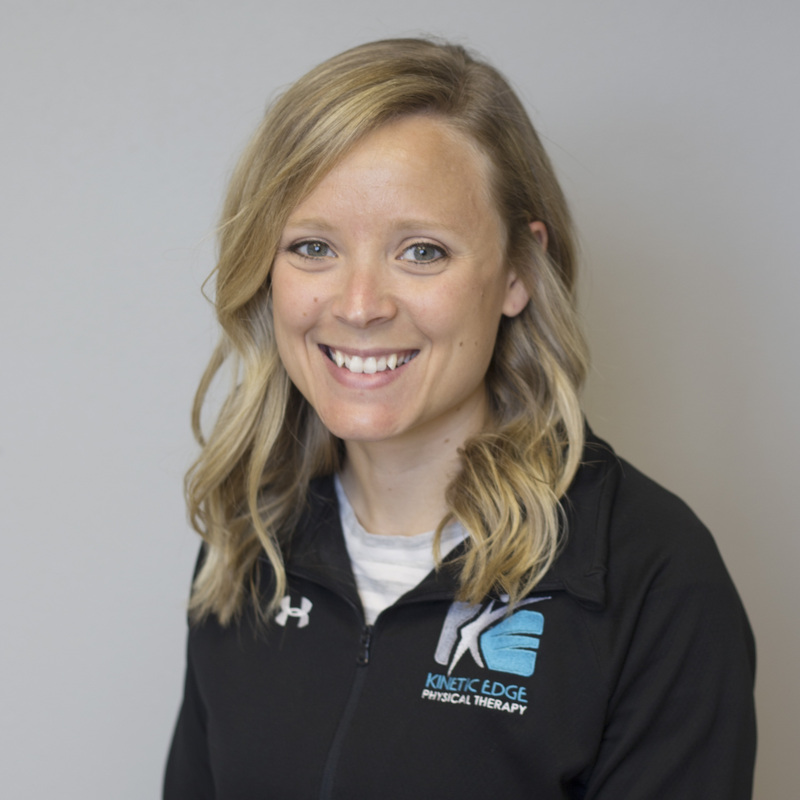 Melissa Hansen serves as a physical therapist for Kinetic Edge Physical Therapy, as well as the Pella clinic manager and a partner in the company. She is also certified in dry needling. Her mission is to serve patients and clients well while treating the entire patient. 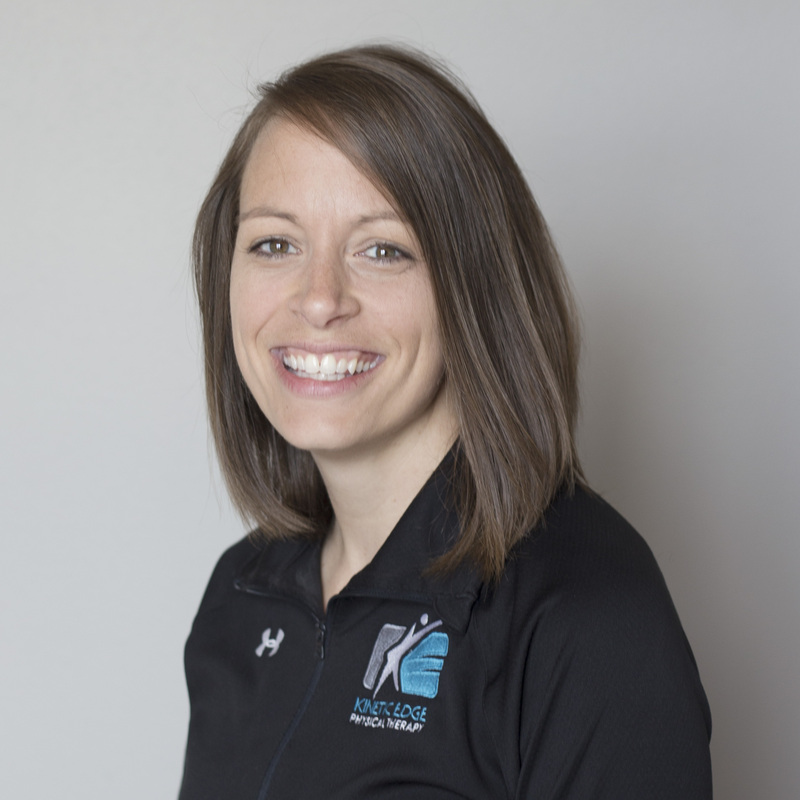 Melissa earned her masters and doctorate in physical therapy from St. Ambrose University after receiving her bachelor’s in exercise science from the University of Iowa. Melissa lives in Pella with her husband Ted and two sons. John Lenderink works as a physical therapist at Kinetic Edge Physical Therapy’s Pella location. John joins the Kinetic Edge team with a wide variety of experience gained in a hospital-based outpatient clinic in Aurora, Colorado. He is dedicated to building relationships with people to help them resume the activities they love. John is particularly interested in the athletic population. He is participating in ongoing study which compares the impact of dynamic warm-ups to static stretching. In his free time, John enjoys playing sports, hiking, biking, watching movies, and spending time with his family. John earned his Doctorate in Physical Therapy from A.T. Still University and his Bachelor’s degree in Exercise Science from Dordt College. John and his wife Lindsay and their daughter, Naomi, are excited about living in Pella. 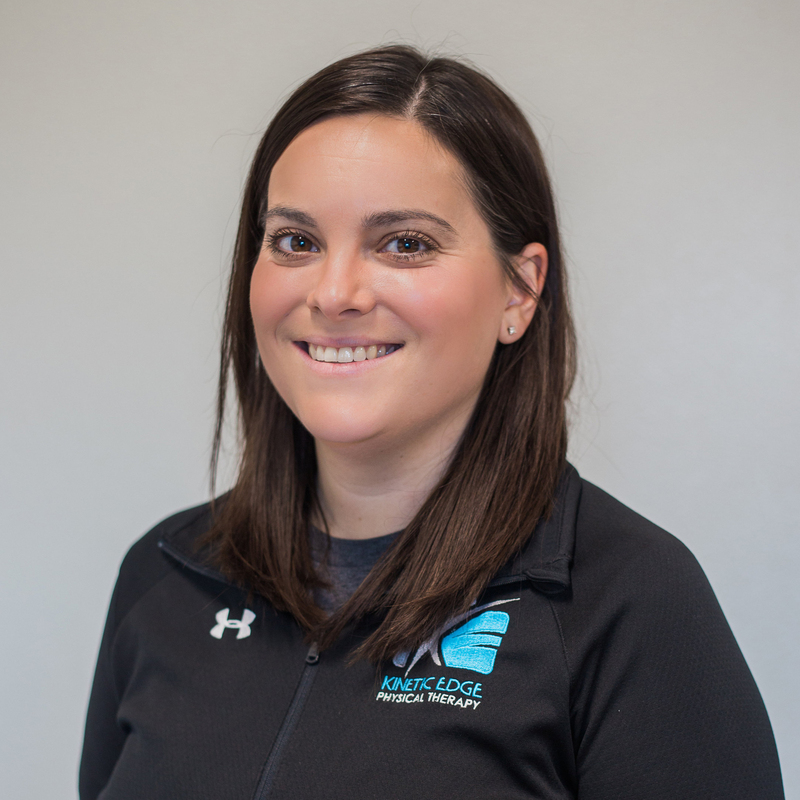 Erica Guinane works as an athletic trainer, front office support person, and back office support person for Kinetic Edge Physical Therapy. Erica is the head athletic trainer for Colfax-Mingo High School where she covers their athletic training room and various sporting events. Erica’s support role for our front office and back office teams makes sure we are providing our customers with the best experience possible. Erica graduated from the Central College with a degree in Athletic Training. She and her husband Matt live in Pella. Liz Vermeer serves as a physical therapist for Kinetic Edge. Her mission is to help others improve their quality of life by helping them improve the way they move. Liz earned a Bachelor’s degree in Psychology and a Doctorate in Physical therapy from the University of Iowa. Liz is from Carroll, Iowa. She has lived in Pella for the past 9 years and it feels like home for her. In her free time, she enjoys running, being outside and spending time with her husband, Micah, and her kids, Sophia, Claire, Nora and Eve. 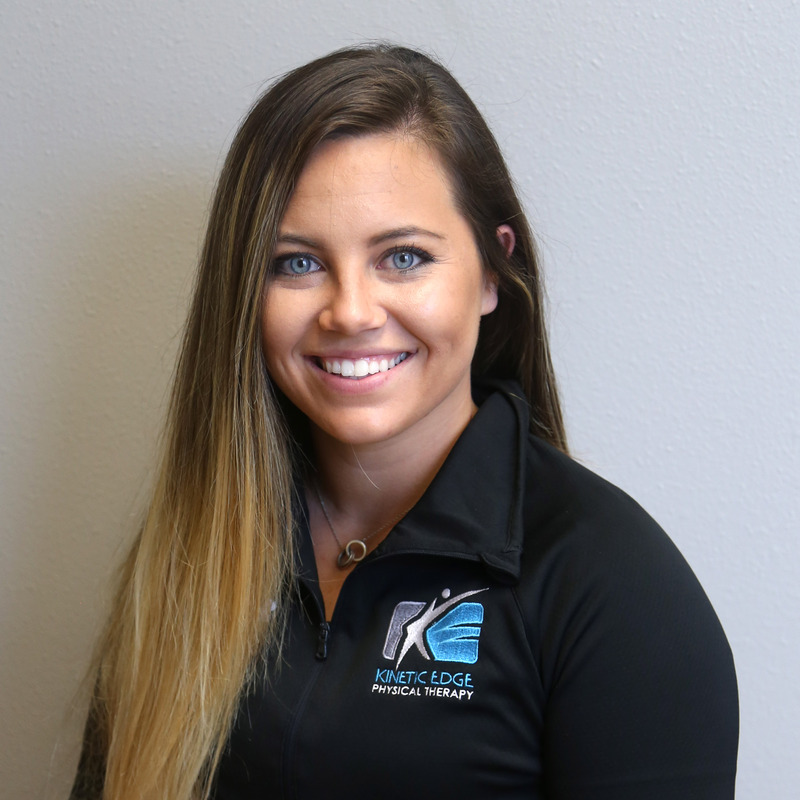 Katie Williams works as an Occupational Therapy Assistant at Kinetic Edge Physical Therapy in Newton, Oskaloosa, and Pella. 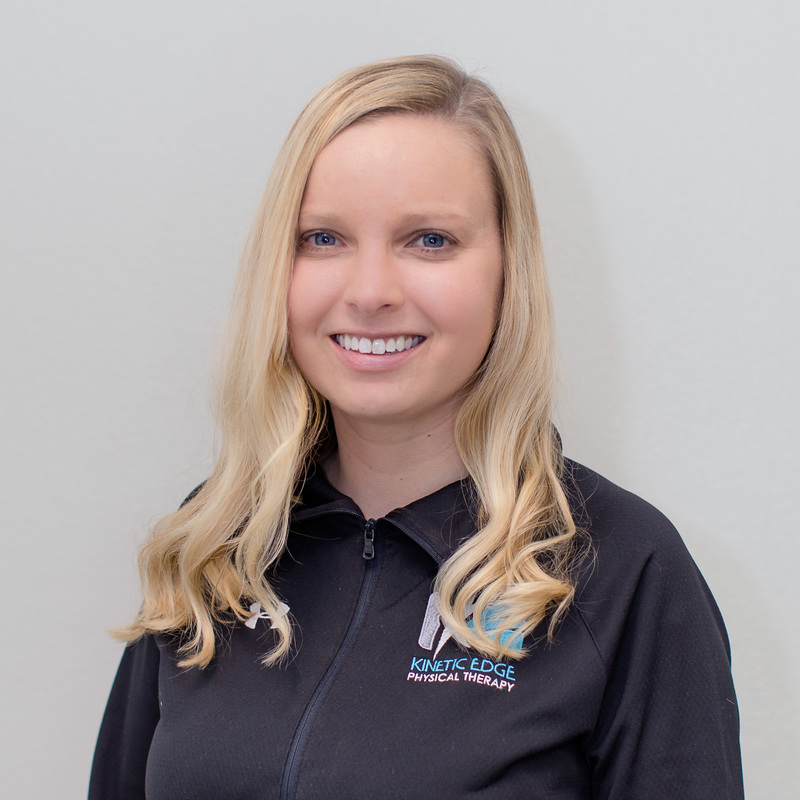 She works primarily with adult hand clients and pediatric clients who struggle with sensorimotor development, sensory preferences, reflex integration, or visual perception. Her mission is to deliver quality occupational therapy and become a strong member of the community. This Lovilia, Iowa native attended William Penn where she earned her Bachelors in Socioloty. She went on to earn her Certified Occupational Therapy Assistant degree from Indian Hills before joining the Kinetic Edge team. Katie currently lives in Pella and is engaged to be married to Sean Gosewisch. Laura Van Zee is the care coordinator at our Pella location. Laura answers the phones, welcomes clients into the office, helps with your questions, does scheduling, and pitches in with whatever else is needed! Laura loves working with people and loves being able to do that at a place that offers hope and healing. Laura and her husband Myron live in Pella. They have four kids and seven grandkids. When she’s not at Kinetic Edge, you’ll likely find her spending time with her family or cooking and baking! As a physical therapist, Todd Schemper enjoys problem solving the cause of a pain or injury to help patients find the best solution for recovery and prevention. 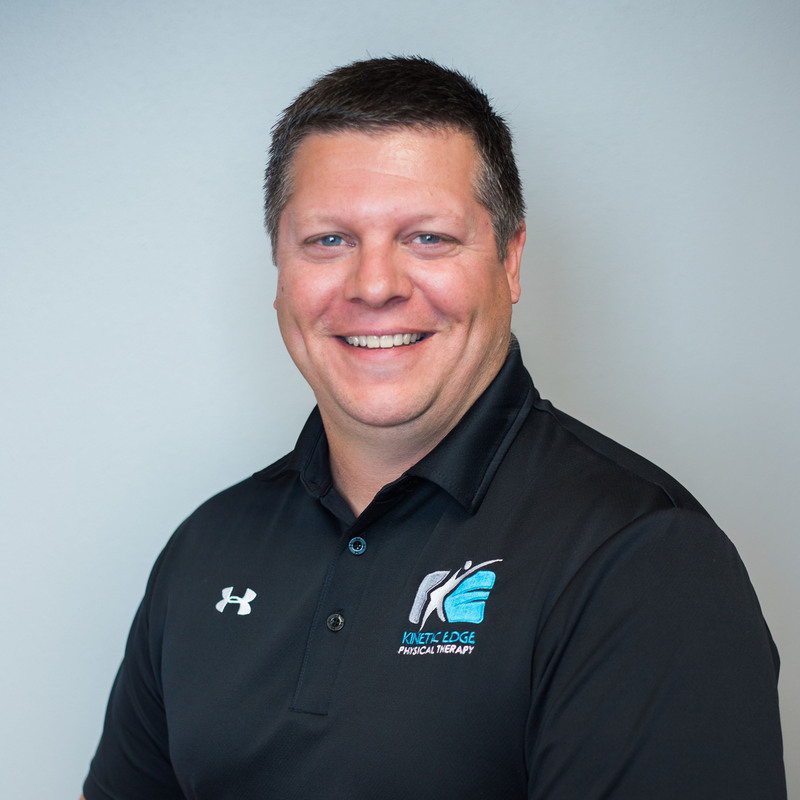 Todd is also the COO for Kinetic Edge, as well as a partner in the company and the Des Moines clinic manager. His mission is to serve those who entrust their therapy needs to him by focusing on treating the whole person since the source of a problem is often not where the complaint is. He enjoys using patient education, manual therapy, and specific exercise to address the needs of his clients. 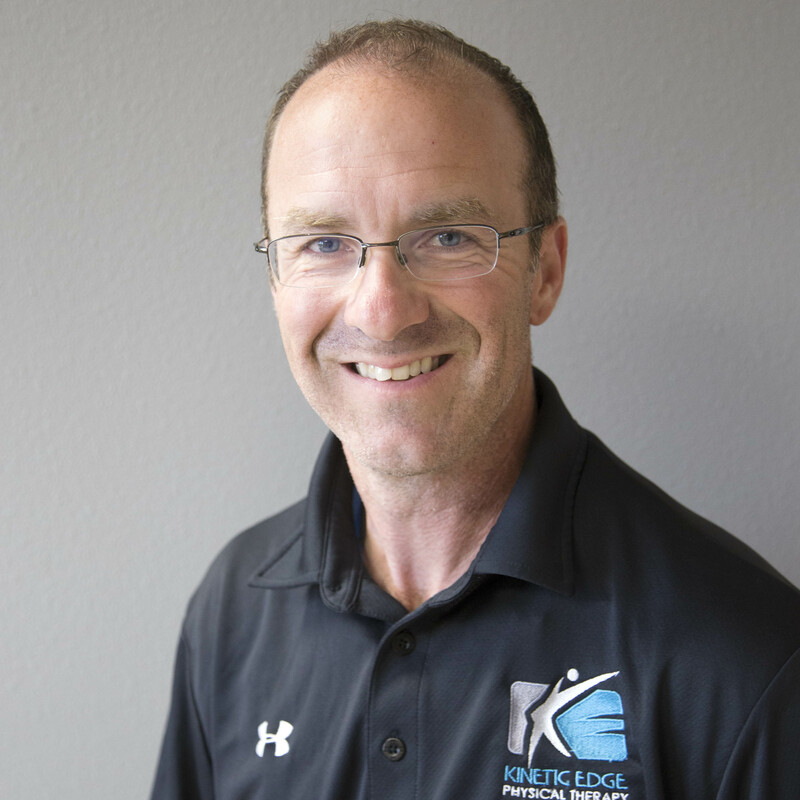 Todd earned his master’s and doctorate in physical therapy from Des Moines University after earning a bachelor’s degree in psychology and exercise science from Dordt College. Todd is also an Orthopaedic Clinical Specialist and a certified Astym provider. Todd resides in Des Moines with his wife Denise and their three kids. Something on his bucket list: He is working on competing in a running race or triathlon in all 50 states and is currently about half way there. James is a physical therapist assistant for Kinetic Edge Physical Therapy. His mission is to serve his patients by providing the highest level of service to promote physical well-being. James earned his Associate’s Degree from Mercy College in Des Moines. 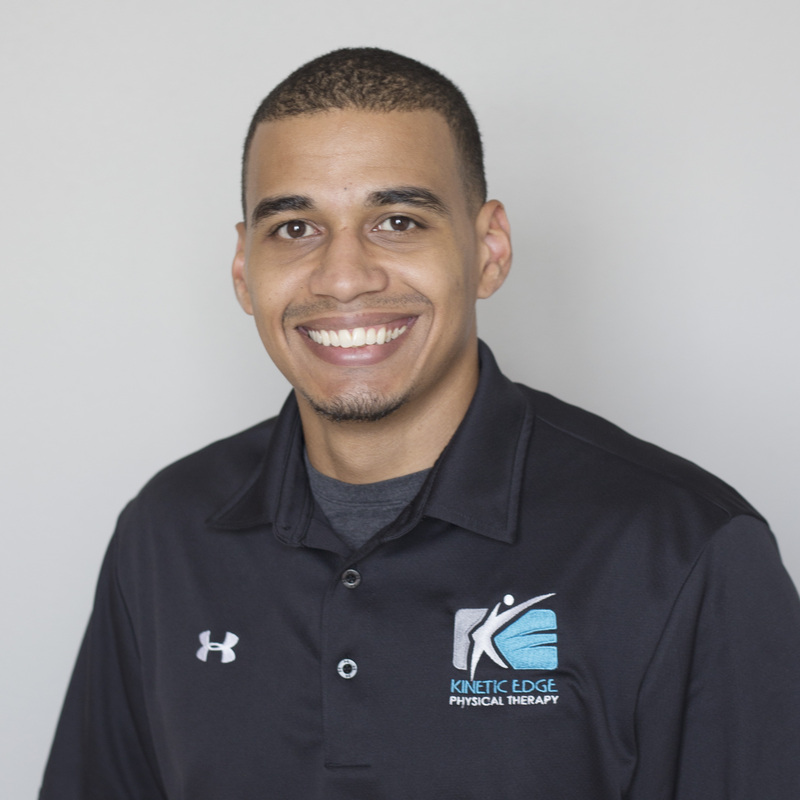 Prior to entering the medical field, James worked as a fitness manager, overseeing personal training at two locations in the Des Moines metro. James lives in Des Moines with his daughter Reagan and their dog Greta, a German wire-haired pointer. 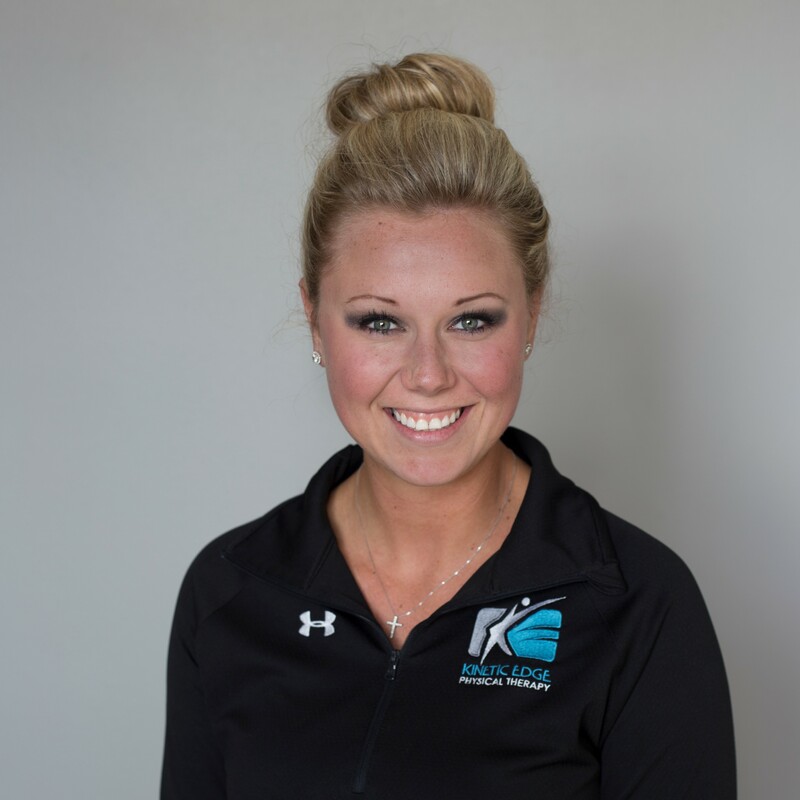 Kaity Hall serves as a physical therapist for Kinetic Edge. Her mission is to serve clients by looking at them as a whole and providing functional treatments, in addition to promoting overall health and wellness. 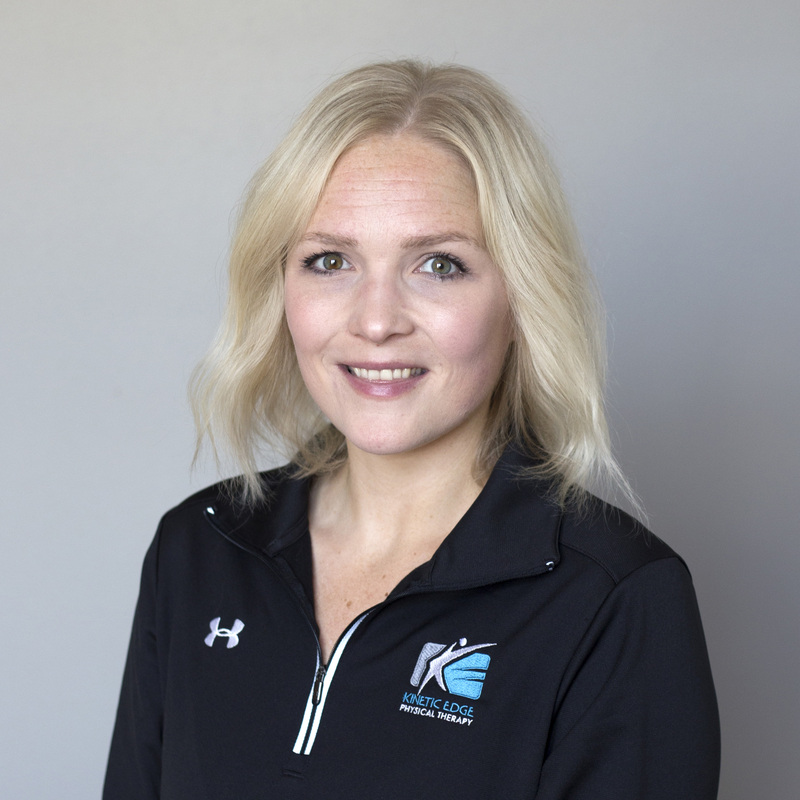 She has a passion for functional treatment and regularly uses a Gary Gray functional movement analysis and treatment approach. Kaity graduated from the University of Northern Iowa with a degree in Athletic Training and then went on to earn her Doctorate of Physical Therapy from Des Moines University. 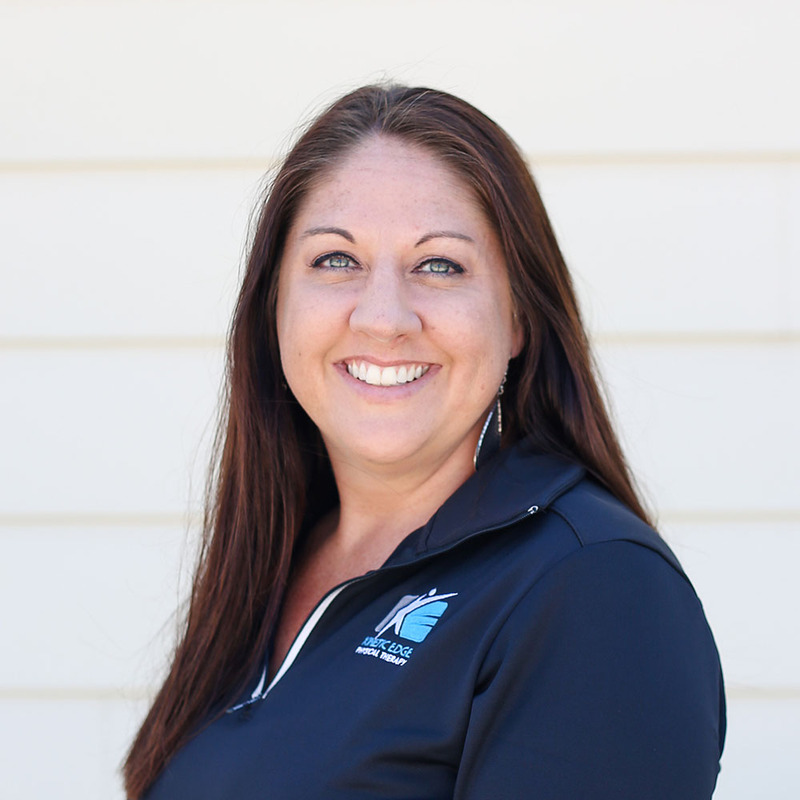 She has previous experience working as a physical therapist and athletic trainer in Waukee. In her free time, Kaity enjoys being outdoors, going to the Farmer’s Market, cooking, and exercising. Kaity and her husband, Austin, live in Urbandale. Patrick Ford serves as a physical therapist for Kinetic Edge. His mission is to to help others regain confidence and hope through movement, exercise, and education. Patrick earned a Bachelor’s degree in kinesiology and health from Iowa State University. He attended Creighton University to earn his Doctorate in Physical Therapy. Patrick is from Mount Prospect, Illinois. He is living in the area with his wife, Sarah, their dog, Fergus and cat, Dixie. In his free time, he enjoys lifting weights, running, camping, hiking, watching movie with his wife. Something on his bucket list: Go backpacking in Yosemite, the Grand Canyon, and many other National parks. Samantha Ferry is the care coordinator at our Des Moines location. Sam answers the phones, welcomes clients into the office, helps with your questions, does scheduling, and pitches in with whatever else is needed! Sam graduated from Central College with a degree in Exercise Science. She and her dog Bella currently reside in Polk City. When Sam isn’t working, you’re likely to find her dancing or crafting. 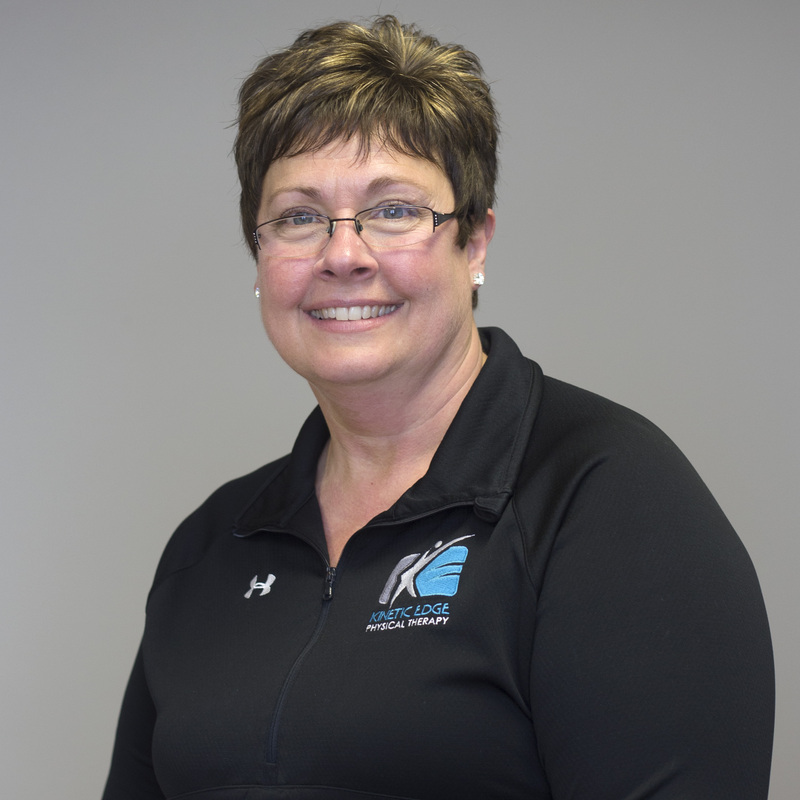 Carol Kelderman manages the Oskaloosa clinic, is a partner in the company, and works as a physical therapist. Carol’s mission is to help find the root cause of a client’s complaint to help them restore function and reach new heights. 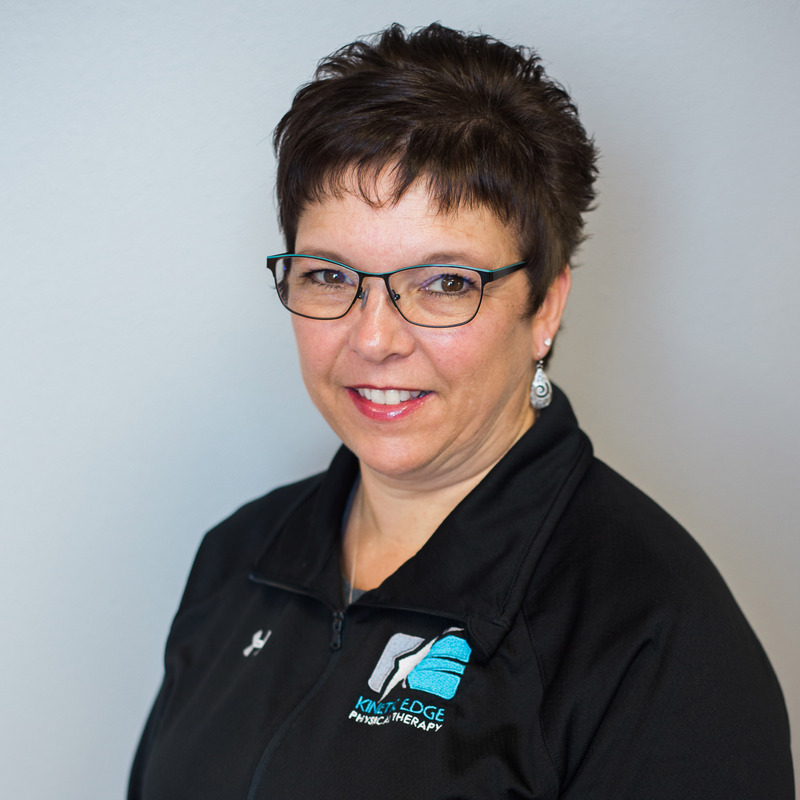 Carol graduated with a Doctorate in Physical Therapy from Creighton University after completing her undergraduate work in exercise science and psychology at The University of Iowa. 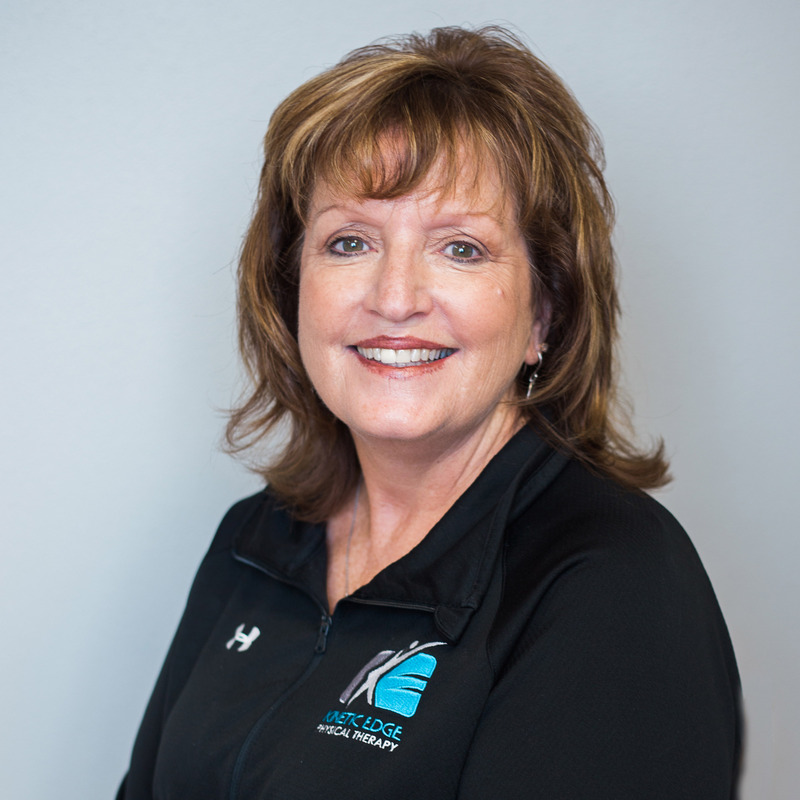 Carol has extensive experience in orthopedics (including sports and post-surgical rehab), women’s health, and neurological rehab and is also a certified Astym provider. She is an adjunct associate faculty member at the University of Iowa Carver College of Medicine. Carol and her husband Jeff live in Oskaloosa with their three kids and chocolate lab. Celebrity she hopes will do therapy at Kinetic Edge: Peyton Manning because he’s a great athlete, smart business man, and highly motivated. If he’s anything like his commercials, he’d be lots of fun. Cory Horstmann enjoys being a physical therapist at Kinetic Edge because he can bring hope to people who may have lost their way. Cory loves developing relationships and encouraging people to take control of their conditions. Cory’s mission is to help people get back to doing what they love. Cory earned his doctorate in physical therapy from Des Moines University after earning his bachelor’s degree from Wartburg College. Cory grew up in Pleasantville but now resides in Oskaloosa. Celebrity he hopes will do therapy at Kinetic Edge: Will Ferrell because there’d never be a dull moment! 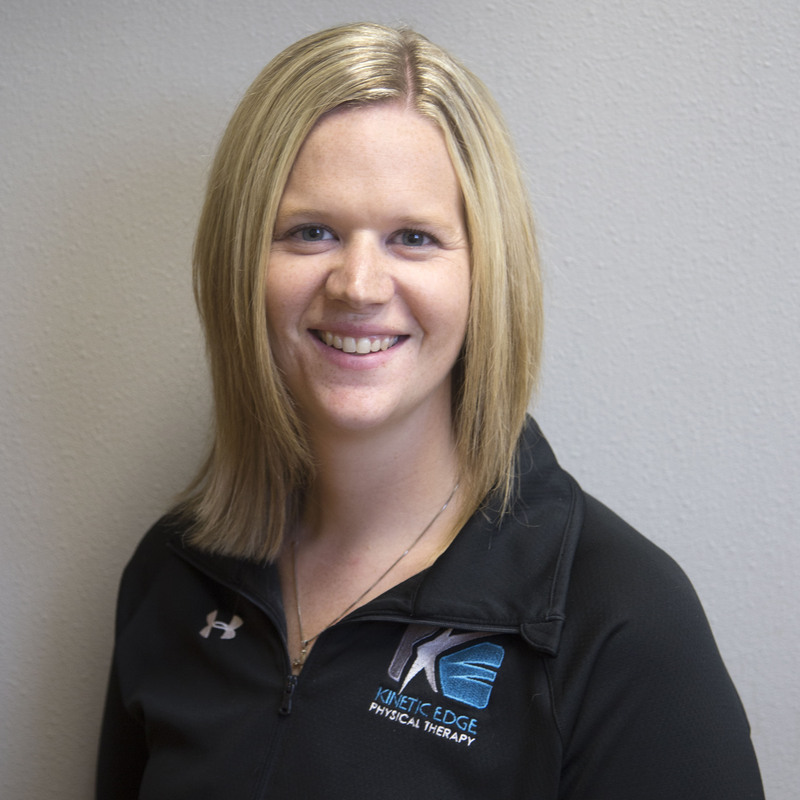 Heather is a physical therapist assistant and athletic trainer for Kinetic Edge Physical Therapy. Her mission is to make people well body, mind, and spirit. 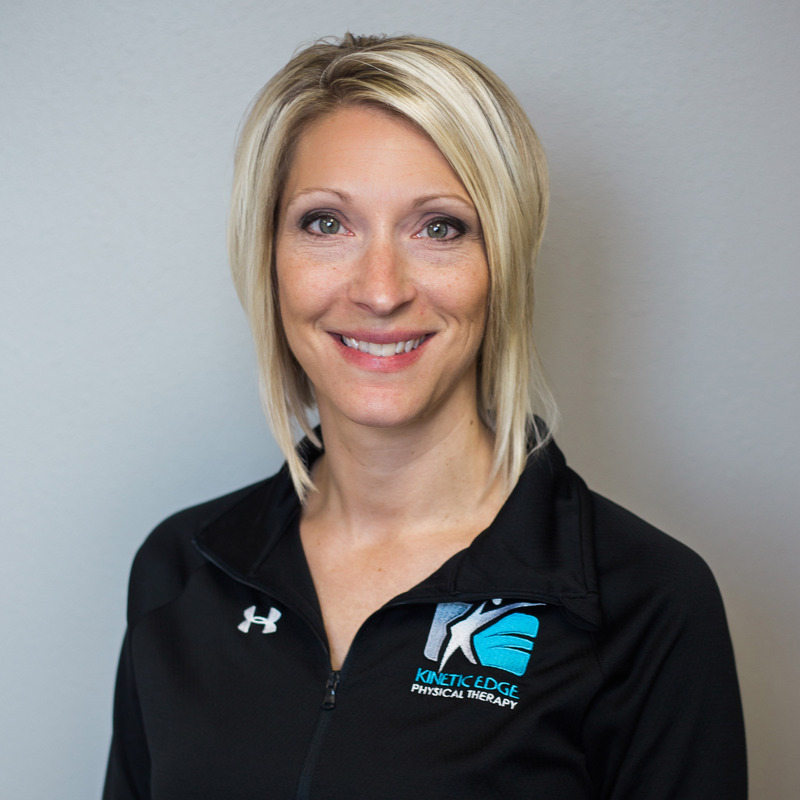 Heather is a 2003 graduate of Central College’s athletic training program, a 2005 graduate of the University of Kansas with a master’s degree in clinical exercise science, and a 2010 graduate of Indian Hills Community College’s physical therapist assistant program. Heather and her husband Eric live in Oskaloosa with their two kids and two dogs. Marjie Rinehart is a care coordinator for our Oskaloosa clinic. Marjie answers the phones, welcomes clients into the office, helps with insurance questions, does scheduling, and pitches in with whatever else is needed! Her mission at Kinetic Edge is to make everyone’s experience the best possible. Marjie earned her degree for medical assisting from Marshalltown Community College. She and her husband Jim have one daughter, two grandsons, and a dog. 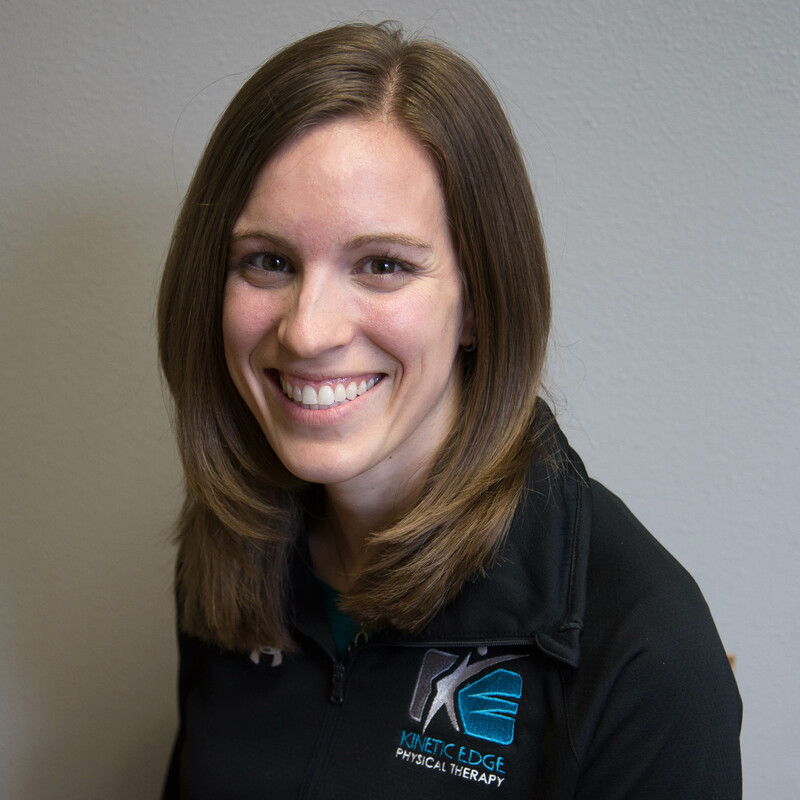 At Kinetic Edge Physical Therapy, Laura works as an athletic trainer. 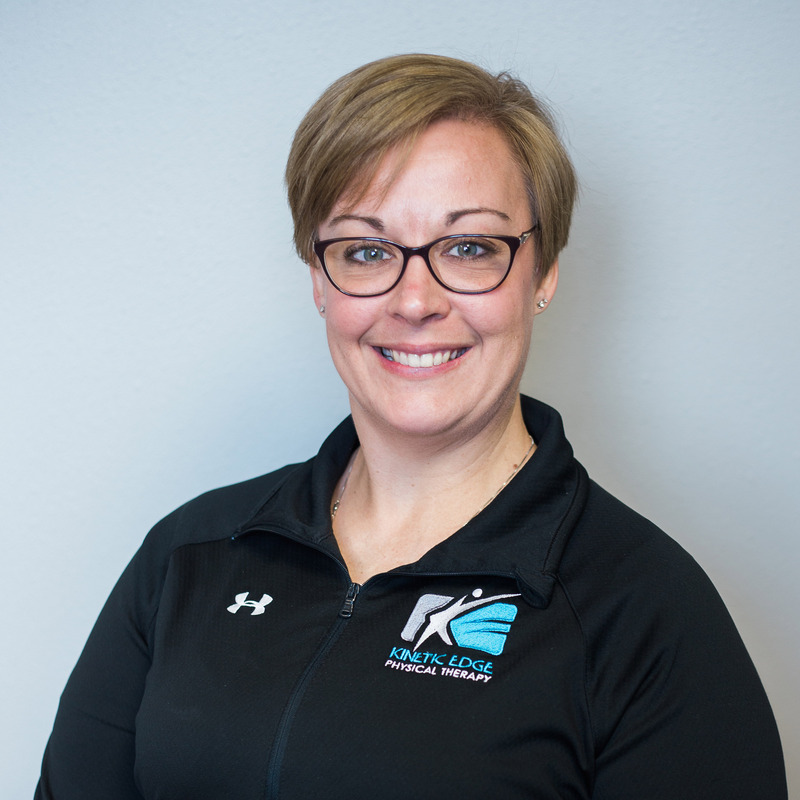 Her mission is to provide athletes, coaches, parents, and the community of Oskaloosa with the best athletic training services possible. 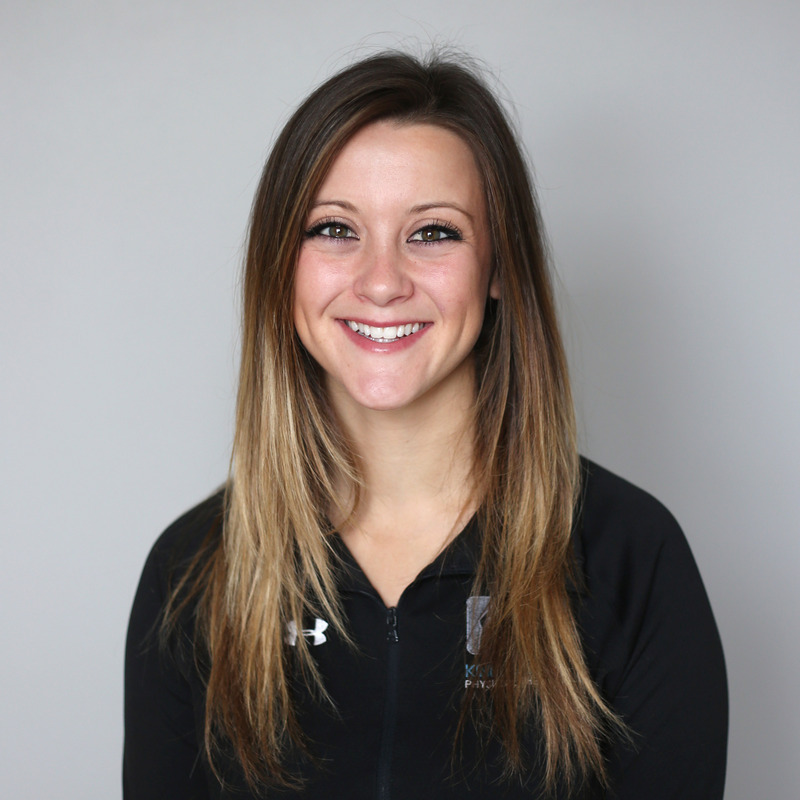 Laura has served the student-athletes at Pella Christian and Oskaloosa High Schools, is an avid CrossFitter, and a new mom. Laura graduated from the University of St. Francis in Joliet, IL, where she was a member of the women’s soccer team, with a B.S. in Biology. She then went to Saint Louis University where she attained her Masters of Athletic Training in 2011. She lives in Oskaloosa with her husband, Clayton, who is on the football coaching staff at William Penn University, their daughter, Grace, and their chocolate lab named Leonia. Derrick Simms works as a physical therapist at Kinetic Edge Physical Therapy’s Oskaloosa location. 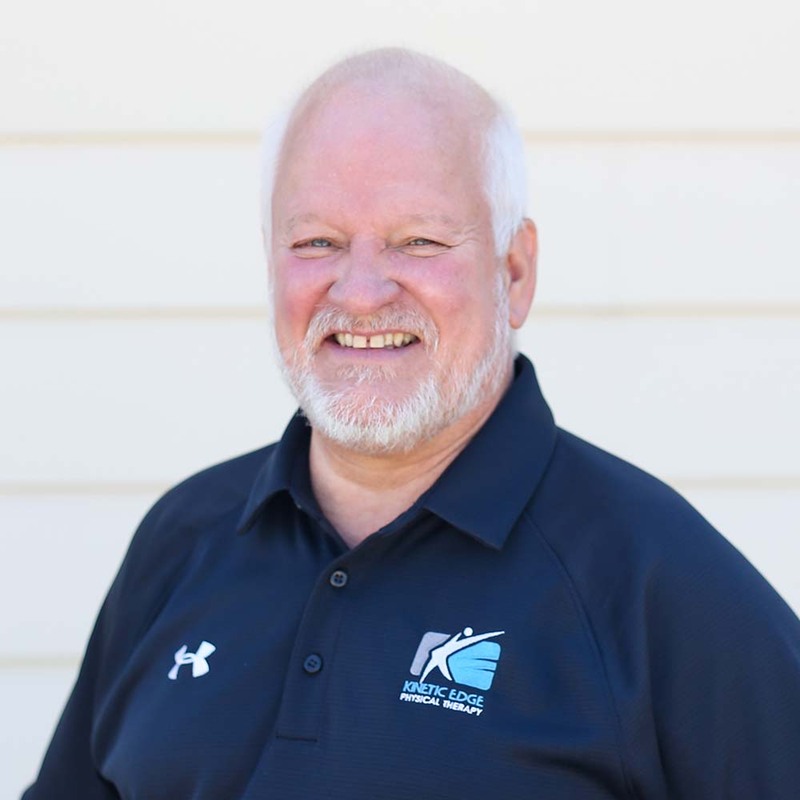 Prior to his time at Kinetic Edge, Derrick worked as a physical therapist assistant for seven years in a variety of settings including inpatient, outpatient, home health, job site, and skilled nursing facilities. These experiences caused him to focus his skills and knowledge on his passion: outpatient physical therapy. It’s his mission to provide each of his clients with knowledgeable and quality care through empowerment and education. Derrick earned his Doctorate in Physical Therapy from St. Ambrose University. He lives in Oskaloosa with his wife Megan and their two sons. Actor he’d pick to play his life: Will Smith, because he can play either a serious or comedic role. Devin Bain works as a physical therapy assistant and athletic trainer for Kinetic Edge. It’s her mission to prevent, treat, and rehabilitate athletic injuries as best possible. Devin graduated from Coe College with a degree in Athletic Training and attended the PTA program at Indian Hills. Devin is originally from West Branch. 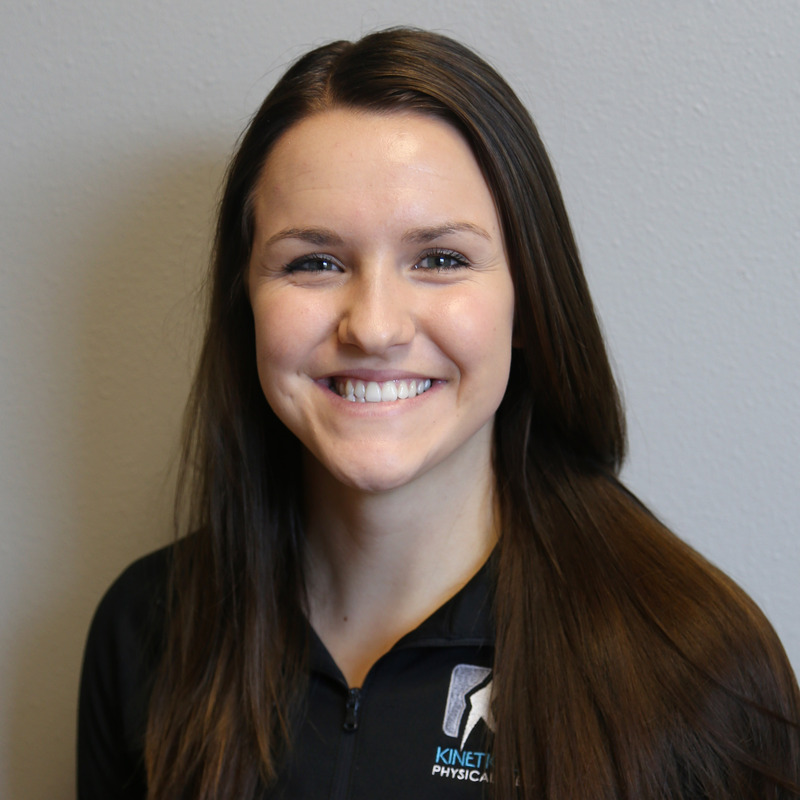 Whitney Vander Veen serves as a physical therapist for Kinetic Edge. 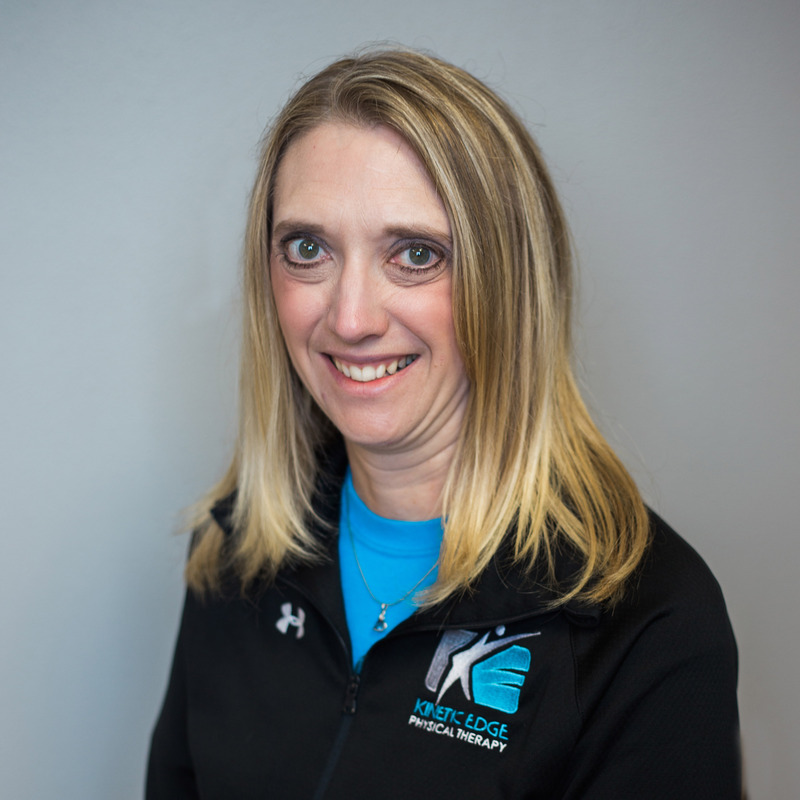 Her mission is to help each of her patients achieve their personal goals through optimization of movement in a positive, educational, and fun environment. 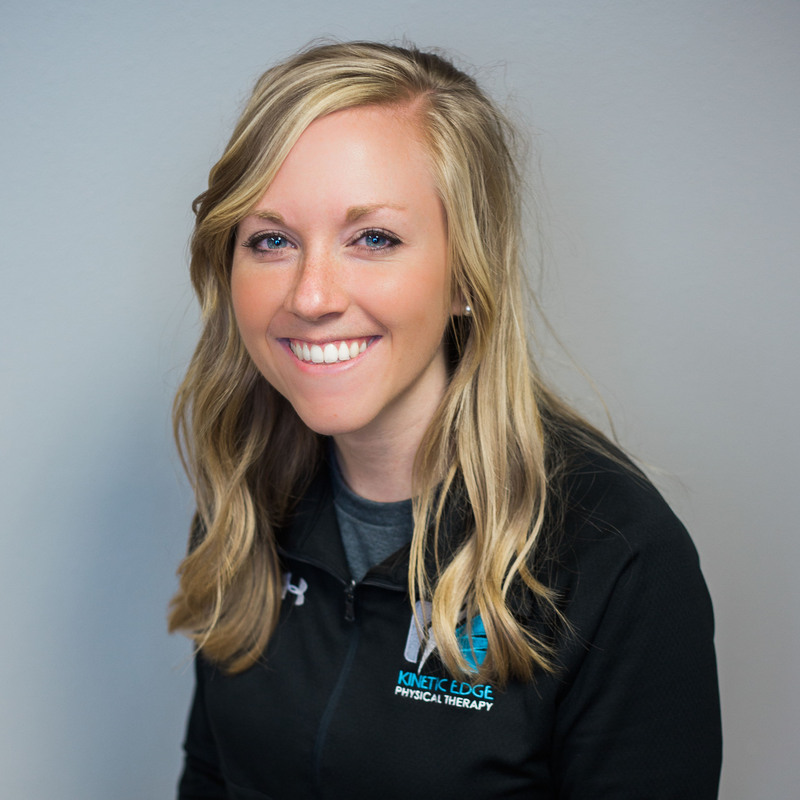 She has a passion for pediatric physical therapy and spent a year working in an outpatient pediatric setting in Omaha. Whitney graduated from Bethel College in Kansas with a degree in Athletic Training and then went on to earn her Doctorate of Physical Therapy from the University of Nebraska Medical Center. In her free time, Whitney enjoys playing volleyball, riding bike, watching movies, and taking naps. Whitney lives in Oskaloosa and is married to Mike Vander Veen. Stacy Crouse is a care coordinator at our Oskaloosa clinic. Stacy answers the phones, welcomes clients into the office, helps with insurance questions, does scheduling, and pitches in with whatever else is needed! She is very excited to be a with a team that plays an active role in the local community. Stacy earned her degree for medical transcription from Indian Hills Community College. She and her husband David have one daughter, one son, two dogs, 2 cats and a bearded dragon. 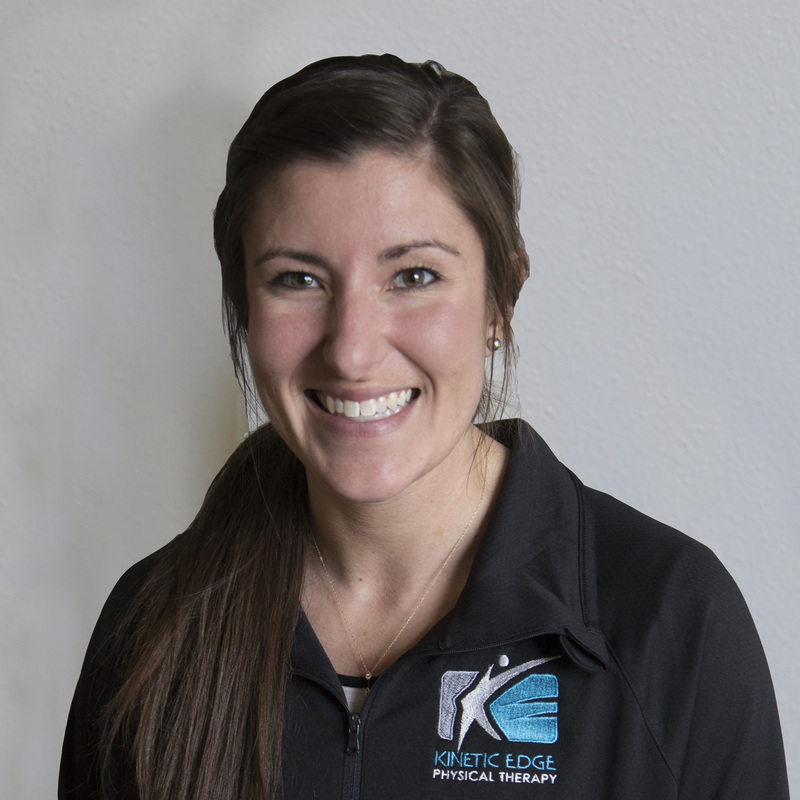 Aimee Dahlhauser serves as a physical therapist for Kinetic Edge. Her mission is to promote health and wellness in everyday life to prevent future injuries and health complications. Celebrity she hopes will do therapy at Kinetic Edge: Isabella Boylston (principal ballerina at American Ballet Theatre) – I am a former ballerina (definitely not professional) but love all there is about ballet and dance! 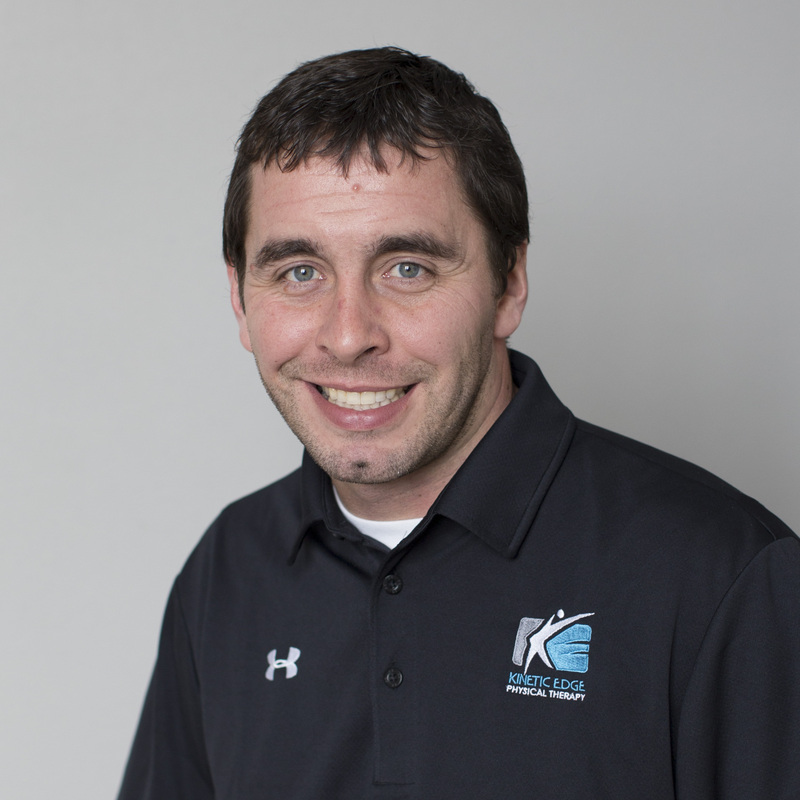 Matt Scotton serves as a physical therapist and athletic trainer for Kinetic Edge Physical Therapy, as well as the clinic manager for Kinetic Edge in Newton. He is also a certified strength and conditioning specialist. His mission is to improve the health and quality of life of as many people as possible. Matt loves to explore nature and human performance. He’s explored his own capacity by competing in a series of five endurance races at 10,000 feet altitude in Leadville, CO in 2011 and 2012 becoming a Leadman each year. Fewer than 250 people have accomplished this, and fewer than 20 have been crazy enough to do it twice. Matt earned his Bachelor’s degree from Central College, his Master’s from the University of Iowa, and his Doctorate from Des Moines University. Matt and his wife, Sandy, live in Newton and have two daughters, Kora and Hannah. Celebrity he hopes will do therapy at Kinetic Edge: George Brett. He was my childhood hero, the greatest player on my favorite team, and a great story-teller with great respect and many life-experiences with three generations of players in the greatest game the world has ever known. Amanda Enochs loves working for Kinetic Edge because she has the opportunity to provide a variety of services to many different types of people. In addition to athletic training event coverage, Amanda helps with the medical fitness program, administers drug and alcohol screens, does pre-work screens, and assists with administrative tasks. Amanda’s mission is to provide many opportunities for people who want to make a change in their lives. Amanda graduated from Simpson College where she majored in athletic training with a minor in exercise science. 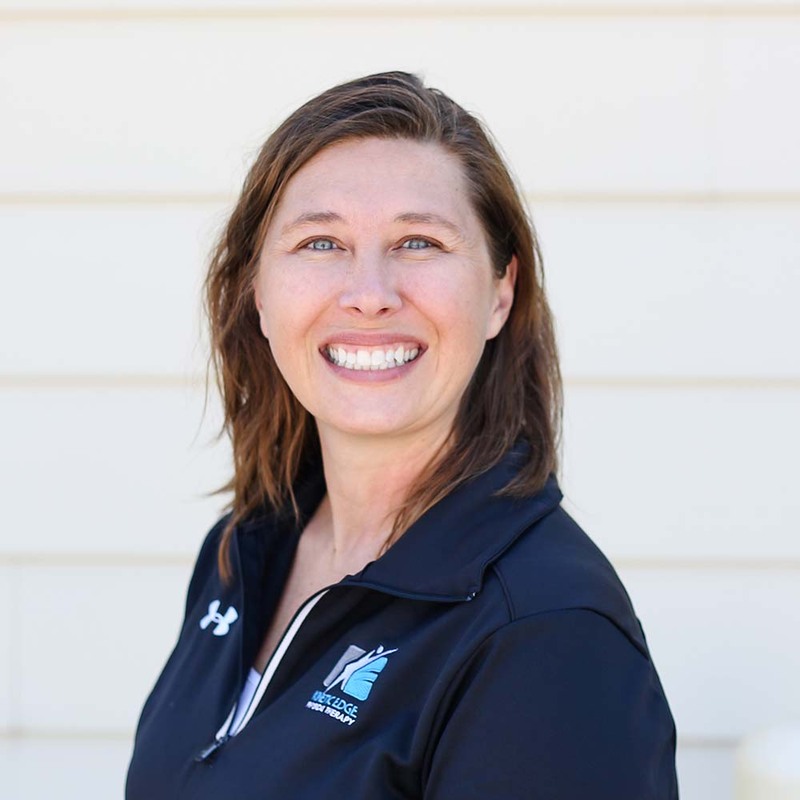 Amanda is a certified functional movement screen provider, is a DOT certified drug screen collector, and has her coaching authorization for Iowa high school softball. Amanda lives in Des Moines with her husky dog and cat. Something on her bucket list: Attend game seven of the World Series where the Indians win in the bottom of the ninth inning on a base hit with two strikes, two outs, and the winning run on second base. Susan Metz serves as a care coordinator for the Newton office. Susan greets clients, answers the phone, helps with scheduling, verifies insurance benefits, enters client data, and pitches in with whatever else is needed! Susan enjoys helping others and love that this position allows her to interact with others while helping them. Susan earned her Associate of Science Degree from DMACC. She and her husband Del live in Newton. They have two adult children who live in Des Moines and also have a black lab and two cats. If she could pick one celebrity to do therapy at Kinetic Edge, she’d pick: Tim Allen because I think he’d be a hoot to work with! Hobbies: I enjoy cooking, baking, and eating which is probably why I love being a Pampered Chef consultant too! 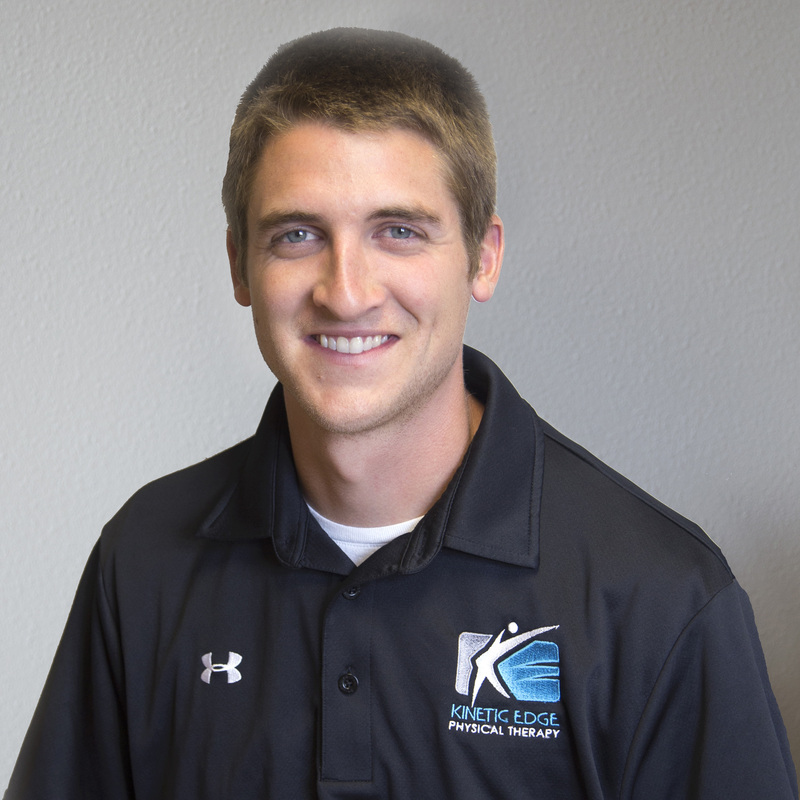 Jared Gerber works as a physical therapist at Kinetic Edge Physical Therapy’s Newton location. Jared’s mission is to empower people to live a healthy life where they are able to work towards and achieve their goals. Jared earned his Doctorate in Physical Therapy from the University of Iowa and his Bachelor’s degree in Allied Health from Cedarville University in Ohio. Jordan Bell serves as an occupational therapist for Kinetic Edge. Her mission is to serve children and families of Newton and surrounding areas by helping all kids be the best version of themselves. She is a pediatric occupational therapist who specializes in primitive reflex integration. She helps kids learn to self-regulate, play appropriately, and meet developmental milestones. Jordan earned her Master’s of Occupational Therapy from the College of Saint Mary. Jordan and her husband, Ryan, are residing in Newton. In her free time, she enjoys spending time with her daughter, Mia, reading, golfing, and traveling. 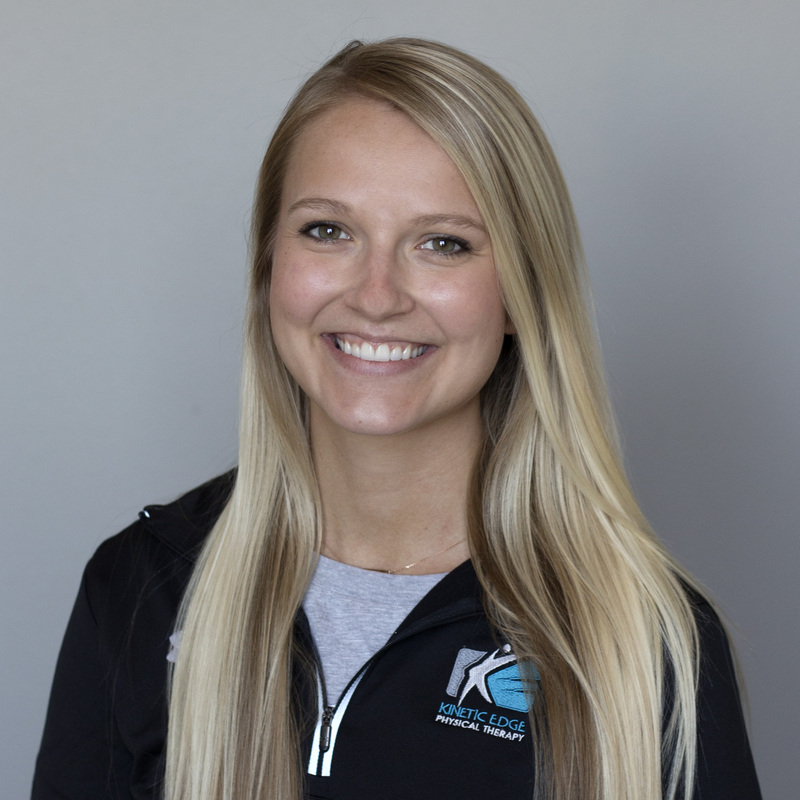 Jayden Kauk serves as a physical therapist assistant for Kinetic Edge. Her mission is to to connect with each client and positively impact them with exercises that will allow them to reach their goals. Jayden earned a Bachelors at Hastings College and then attended Clarkson College in order to become a Physical Therapist Assistant. She is from Farwell, Nebraska. She currently lives in Johnston. In her free time, she enjoys puzzling, scrapbooking, working out and reading. 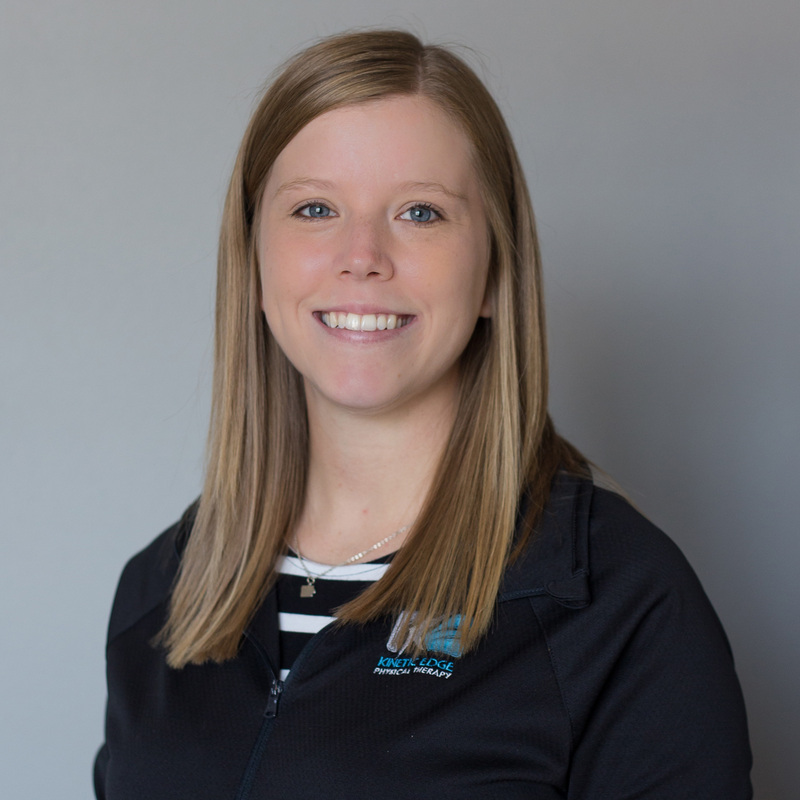 Bailey Terpstra serves as both an athletic trainer and a care coordinator in our Newton physical therapy clinic. As the care coordinator, she strives to make everyone who walks in our clinic feel welcome. 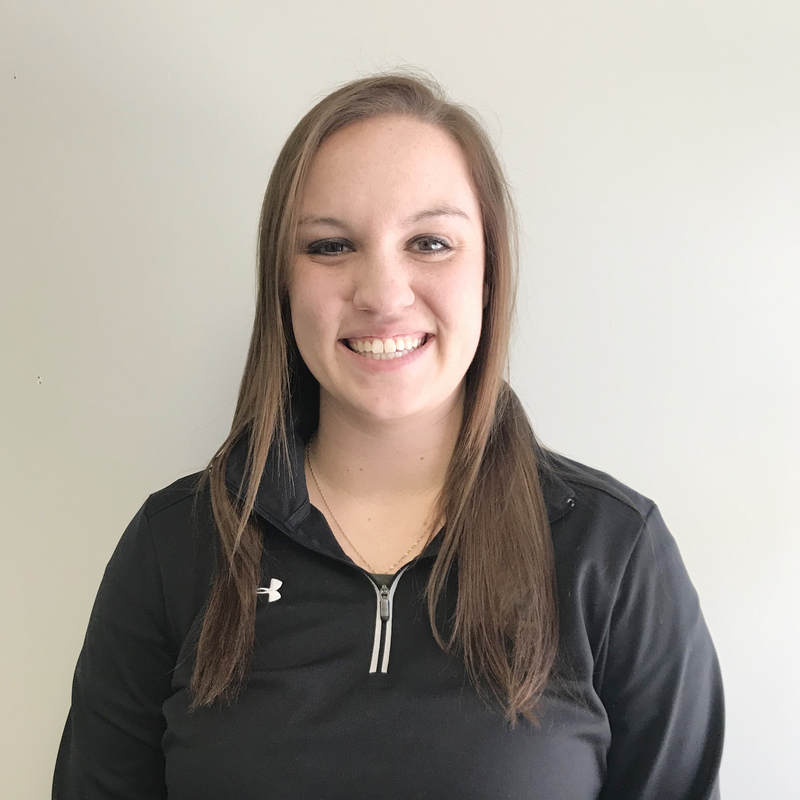 As the athletic trainer for Colfax-Mingo High School, she works to provide quality care for students athletes and develop trusting relationships with them. Bailey loves to educate athletes, coaches, and parents on the importance of safe participation in sports. Bailey graduated from Simpson College with a degree in Athletic Training. She is also CPR certified. Bailey and her fiancé Mason live in Lynnville with their son EJ and their dog Oli. Allison Garmager serves as a physical therapist for Kinetic Edge Physical Therapy in Newton. 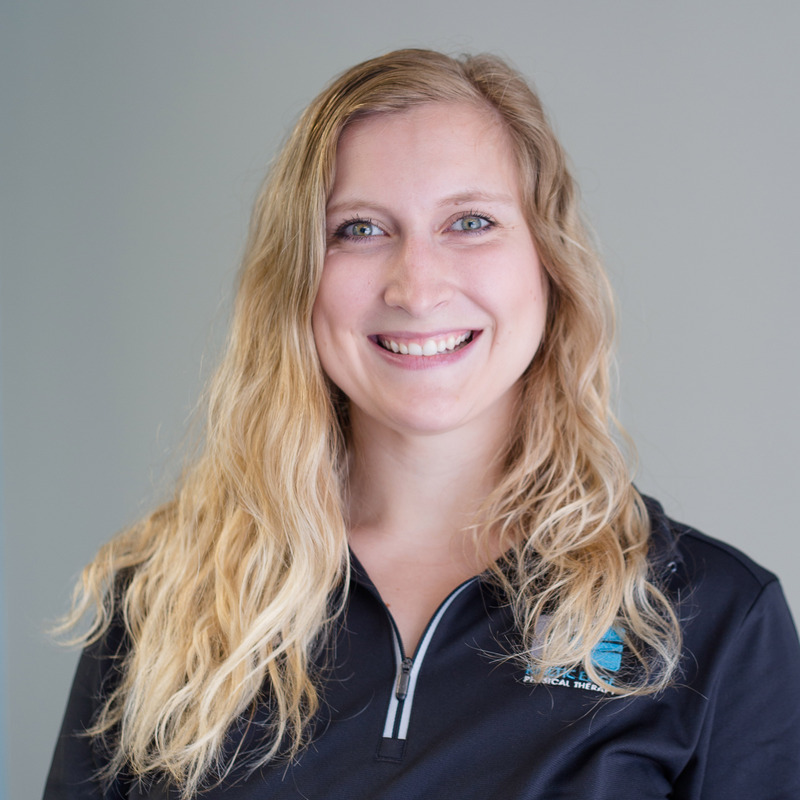 Her mission is to assist her clients in achieving their goals and improving their quality of life through positive interactions, encouragement, and optimal physical therapy treatment. Allison earned her doctorate in physical therapy from the University of Iowa after receiving her bachelor’s in Human Physiology from the University of Iowa. This Iowa City native currently resides in Des Moines. Celebrity she’d pick to do therapy at Kinetic Edge: Anthony Rizzo… Go Cubs! 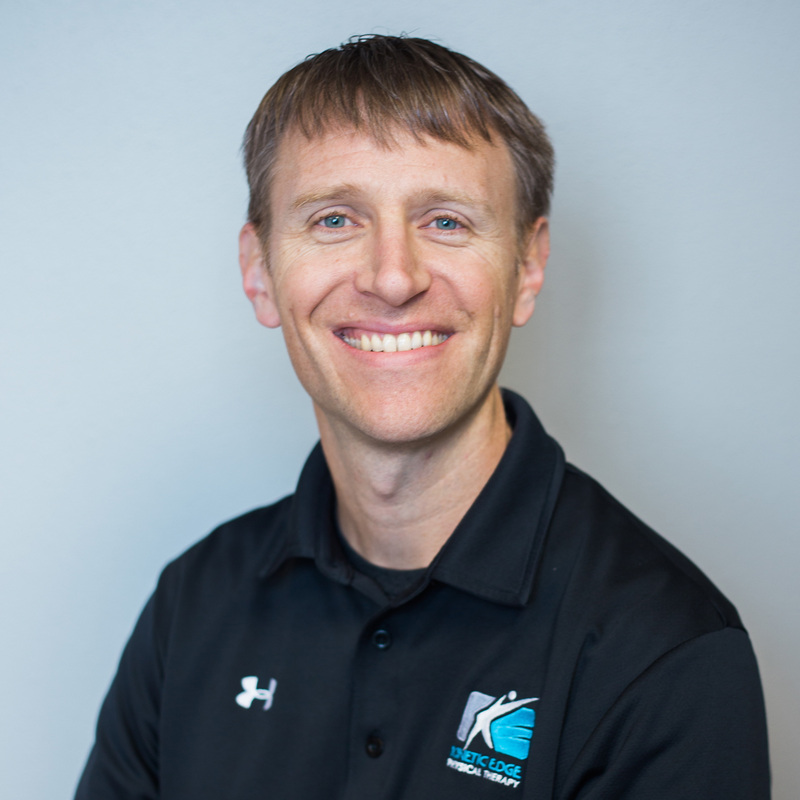 Tim Vander Wilt serves as a physical therapist for Kinetic Edge Physical Therapy, as well as the Ames clinic manager. He is also certified in dry needling. His mission at Kinetic Edge is to help people move and function better. Tim graduated from Central College with a degree in Exercise Science before earning his masters of science in physical therapy from Des Moines University. Tim and his wife Laura live in Ames with their four children. 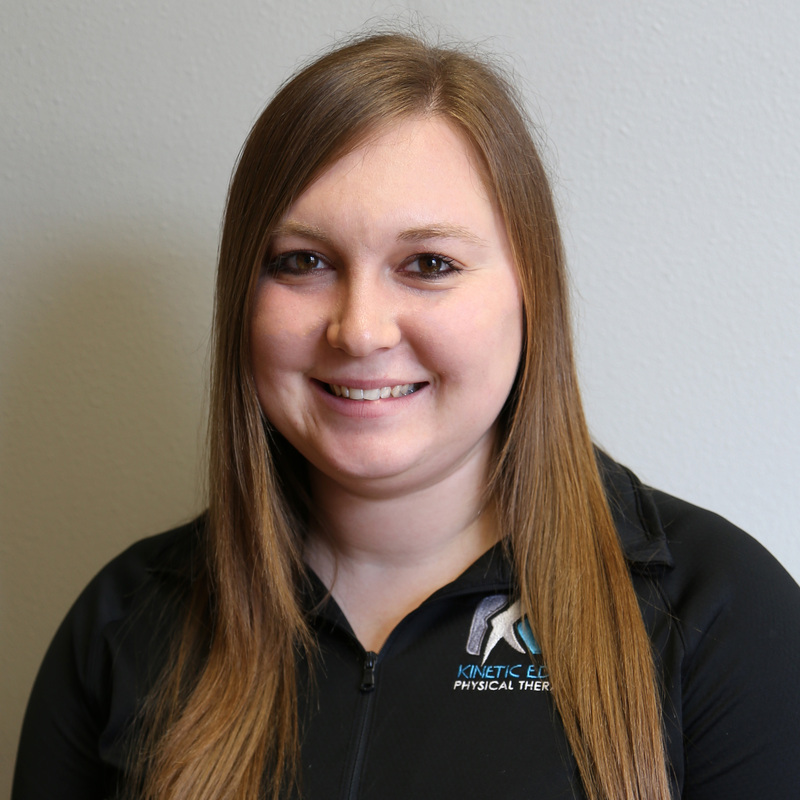 Rachel serves as an athletic trainer in our Ames physical therapy clinic and also handles the administrative tasks for our clinic. In addition, Rachel helps run our Medical Fitness Program. Rachel’s mission is to help and encourage people on their path to physical well-being. Rachel earned her Bachelor’s degree in athletic training from the University of Northern Iowa. She spent over seven years working as an athletic trainer to area schools with McFarland Clinic. Rachel and her husband Ben reside in Ames with their two daughters, Reese and Kendall. Actress she’d pick to play her life: Amy Jo Johnson, the original pink power ranger because she’s been told many times she looks like her! Casey Negrete serves as a physical therapist for Kinetic Edge. 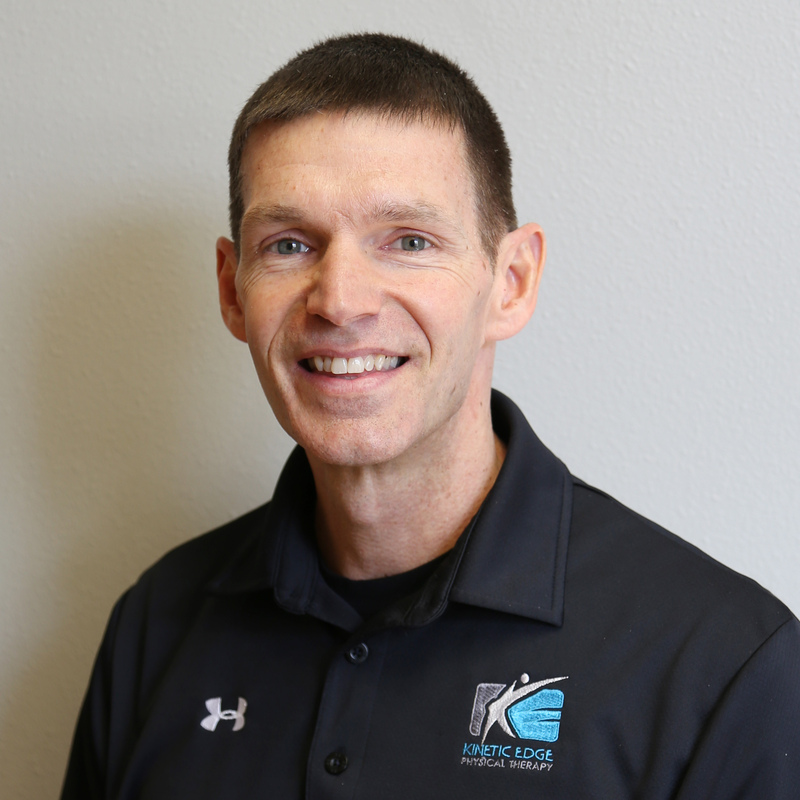 His mission is to use his knowledge of human anatomy and physical rehabilitation, along with available resources, to help each patient meet their goals in an effective and efficient manner. Casey earned his Doctorate in Physical Therapy from the Trine University in Fort Wayne, Indiana. He earned his Bachelor’s degree in Kinesiology from Iowa State University. Casey and his wife, Maggie, and their dog, Roxi, will be moving to Ankeny. In his free time, he enjoys Spending time with family, playing with his dog, golfing, playing basketball, watching sports, and cheering for the Cyclones. 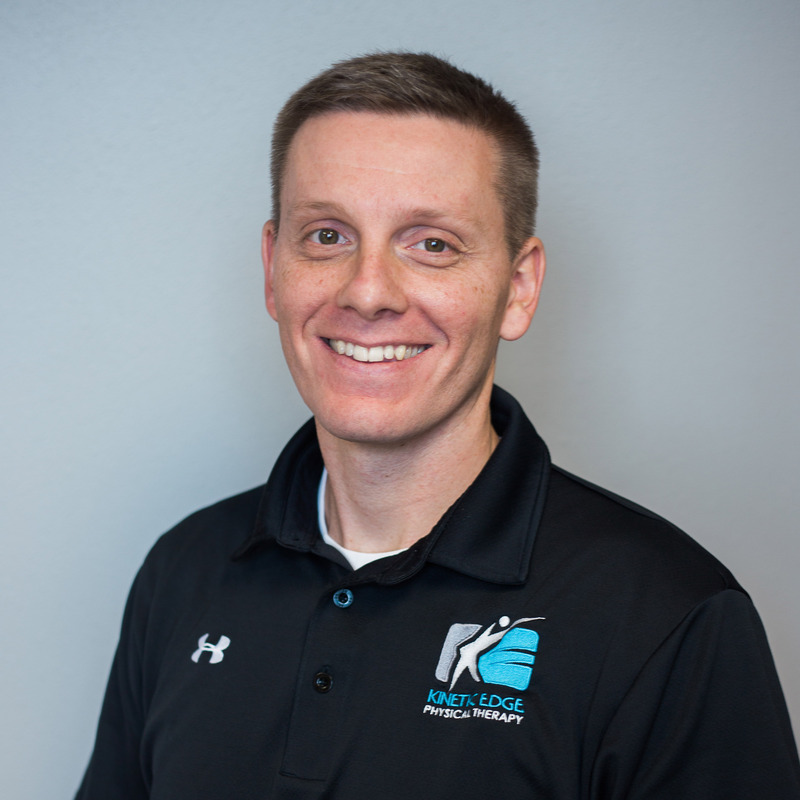 Troy Vander Molen is the CEO and CFO of Kinetic Edge Physical Therapy. He works closely with each location to help develop their clinic and build relationships. He also consults with a large variety of industries and organizations to help them develop unique solutions to their distinct work injury needs. In addition, he serves as an adjunct faculty for WorkWell Systems, Inc. to perform training for therapists throughout the country in their unique work injury management and prevention solutions. Troy’s mission at Kinetic Edge is to restore hope and health to individuals and organizations by helping them move better, feel better, and function better. Troy graduated from Dordt College in Sioux Center, Iowa with a B.S. in Exercise Science in 1994 before attending the University of Iowa’s Physical Therapy Education program where he earned his Master’s of Physical Therapy in 1996. He completed his transitional Doctorate in Physical Therapy (DPT) through Evidence in Motion’s (Louisville, KY) Executive Program in Private Practice Management program in 2013. Troy lives in Pella with his wife Steph and their three children. Celebrity he hopes will do therapy at Kinetic Edge: Martin Luther King, Jr. – I realize that he is no longer living, but a man can dream, right? Renae Oppenhuizen is the practice manager and assistant financial officer at Kinetic Edge Physical Therapy. Renae understands that the financial portion of healthcare can be confusing and stressful, which is why it’s her mission to provide accurate and timely billing for our customers. If you have questions or concerns about your account, she’s the person you want to talk to! 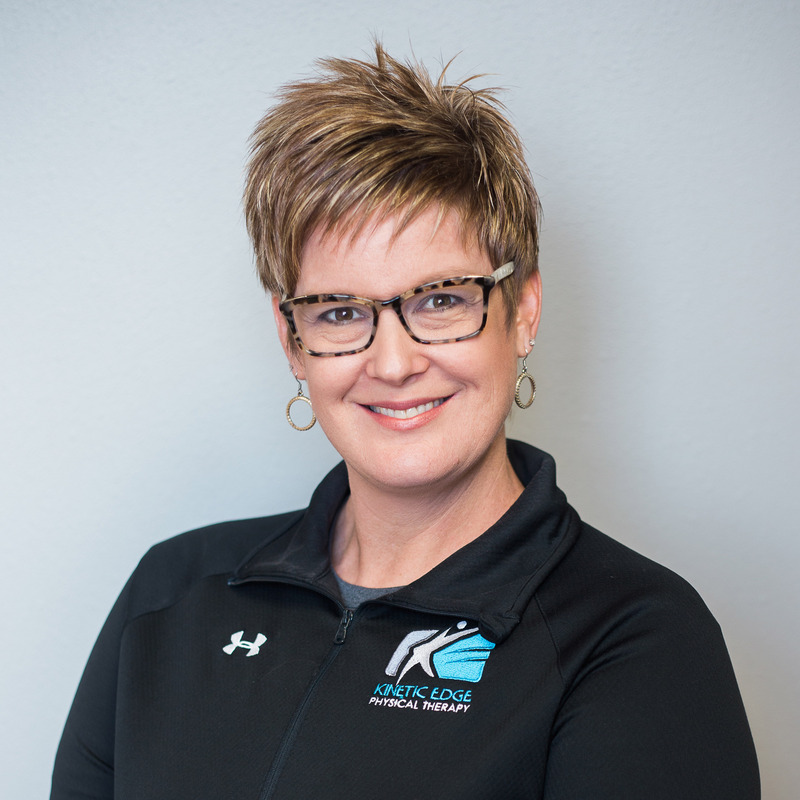 Renae earned her degree in business management from the University of Northern Iowa and has been a part of the Kinetic Edge team since 2003. Renae works out of our corporate headquarters in Pella. She also resides in Pella with her husband Kent and daughter Lauren. Lindsey is the marketing specialist for Kinetic Edge. She created the Kinetic Edge logo and keeps the creative juices flowing around here. Lindsey’s mission is to readily communicate the hope, health, and happiness that the Kinetic Edge team restores daily in the lives of people across the Midwest. She also strives to make information easily accessible so people can make an educated decision about their health needs. Lindsey graduated from Northwestern College in Orange City with a degree in Public Relations. Lindsey works primarily out of our corporate headquarters in Pella and lives in Pella with her husband Tyler and cat Kodak. 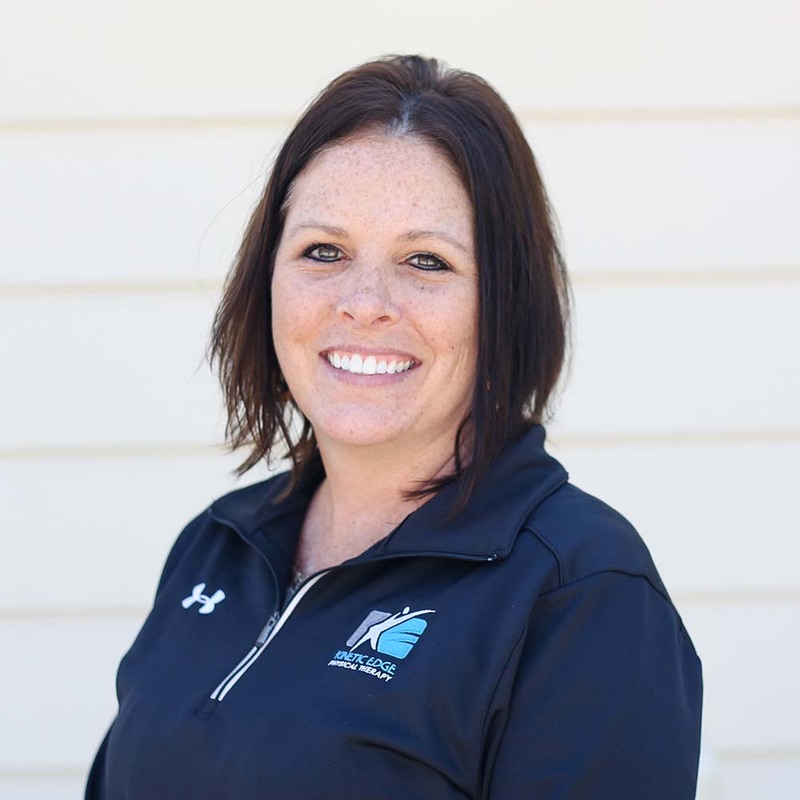 Kimmy Van Zee is our assistant office manager at Kinetic Edge Physical Therapy. She works alongside Renae Oppenhuizen doing the many back office tasks that keep our clinics running as smoothly as possible. It’s her mission to help provide clients with the best care possible throughout their entire experience at Kinetic Edge. From the first time you call in to schedule an appointment to your last visit, Kimmy works to find the best ways to serve you and meet your needs. 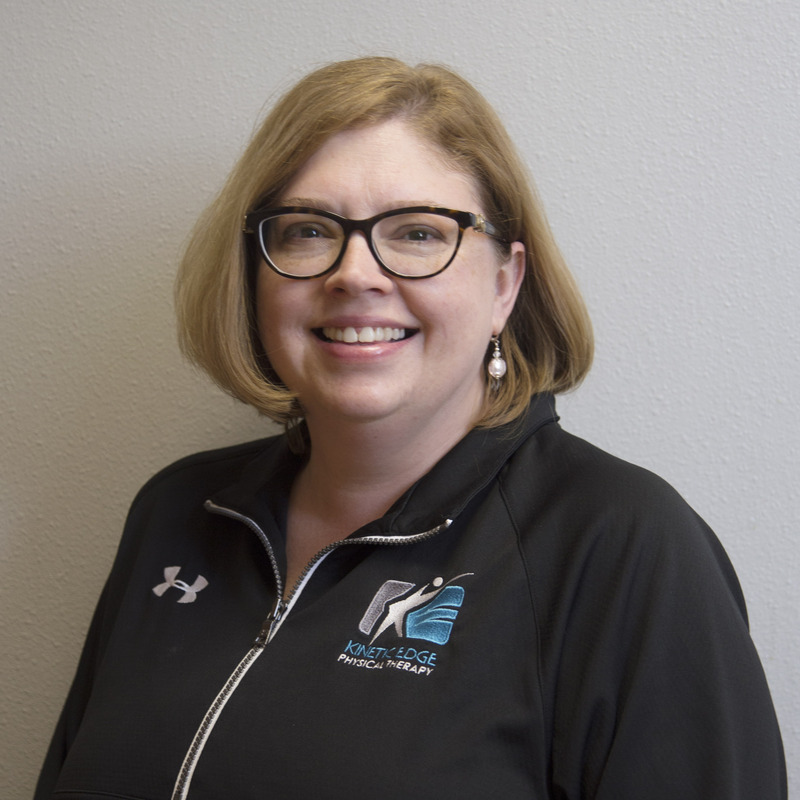 Kimmy earned her degree in sociology and business administration from Central College and has been a part of the Kinetic Edge team since 2016. Kimmy works out of our corporate headquarters in Pella. She lives in Pella with her daughter Maddy and their kitten Charlie. Her favorite season of the year: Summer – Sprint Car racing season! Her favorite band: Lady Antebellum – Kimmy’s been to all of their concerts in Des Moines so far! Kristin Bremner serves as a Collections Specialist for Kinetic Edge. She will be resolving any billing problems and collections within the insurance companies. Kristin attended The University of Iowa before transferring to earn a degree in Communications from The University of Minnesota. Kristin is from Minneapolis, Minnesota. She currently lives in Pella with her Husband, Andy and their two cats. In her free time, she likes to spend time outside, especially if its on the water. If she is on the water or not, spending time with friends and family is very important to her as well. If she were stranded on an island, she’d bring: I would want to bring people, but would have a tough time narrowing it down to three! Lisa’s mission is to make our clients feel comfortable and confident, knowing we’ll do our best work for them while helping them with all of their insurance needs. Lisa earned her bachelor’s degree in social work from Dordt College. She and her husband Matt live in Pella with their son, daughter, cat, and dog. Something unique about her: When she sneezes, she sneezes in fives! 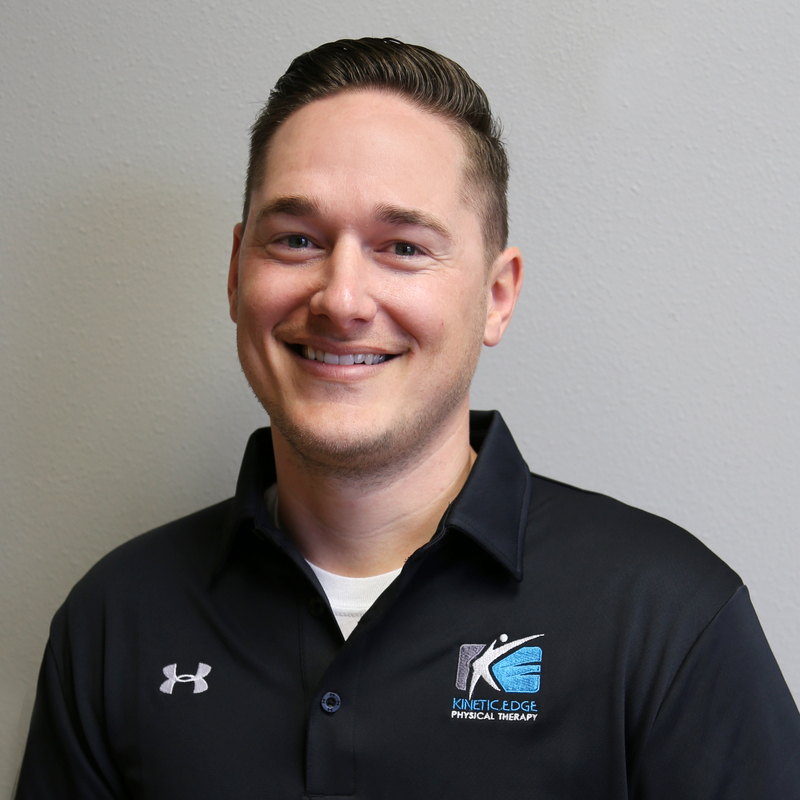 Jesse is the sales and marketing director for Kinetic Edge Physical Therapy. He works closely with each location to help with all aspects of business development and marketing. He also works with a large variety of industries and organizations to help them optimize their worker’s compensation programs. Jesse’s mission at Kinetic Edge is to restore hope and health to individuals and organizations by working to get them connected to providers who can help them move better, feel better, and function better. Jesse graduated from Iowa State University in Ames, IA with a BA in 2005. Jesse lives in Ankeny with his girlfriend Amanda and his two children. Alyssa is our Front Office Liaison. In this role, Alyssa develops and implements efficient and consistent front office procedures with our Care Coordinators, as well as efficiencies within our scheduling software for our providers and back office. She’s also our Care Coordinator and Insurance Specialist back up. There are a variety of additional areas in which she supports our team including IT, credentialing, insurance plan updates, and more. Alyssa strives to make every client feel valued and taken care of whenever they contact us and whenever they come into our clinic. Alyssa earned her associates of science in business and administrations from Parkland College in Champaign, IL. She and her husband Nathan have one cat named Ivan and 3 horse, Angel, Will and Phanni. Ray Tresemer is a physical therapist at Kinetic Edge. 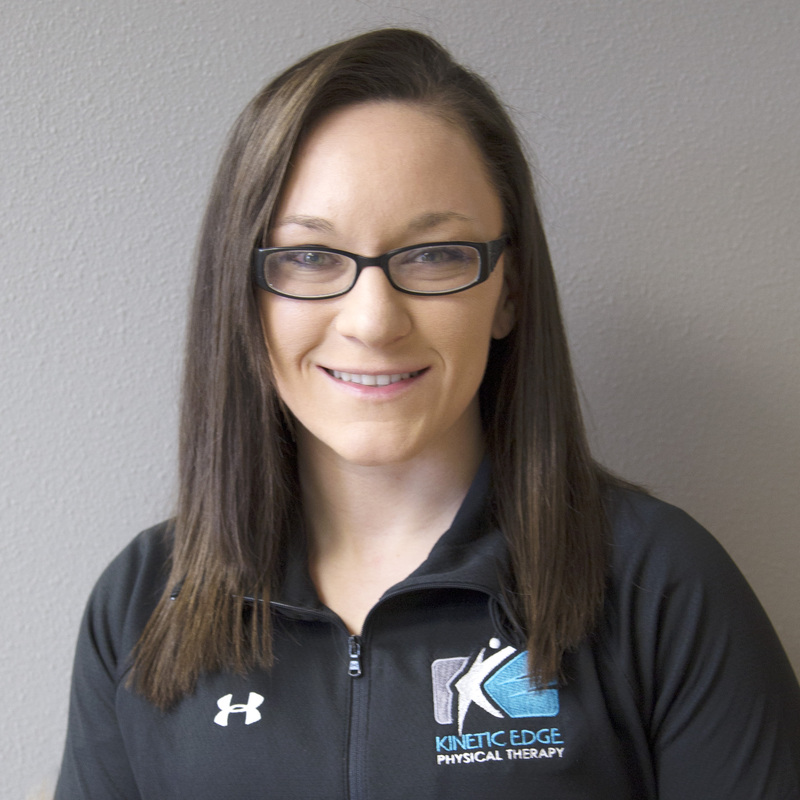 Jodeann Cooley serves as a physical therapist assistant for Kinetic Edge. Jodeann ‘s mission is to help patients improve their quality of life. Jodeann attended Indian Hills Community College to become a physical therapist assistant. Jodeann is from Albia, Iowa. In her free time, she enjoys reading, watching baseball (Go Cubs!) and spending time with her husband, Tim, and their kids, Gavin, and Kennedy, along with their two cats, Boo and Jasmine. 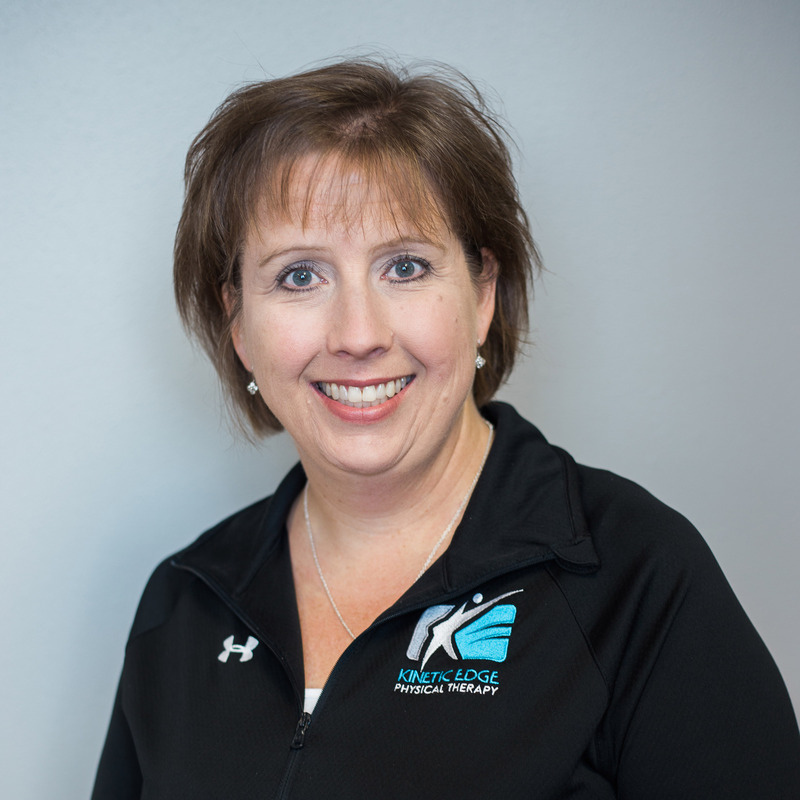 Marcy Jones serves as a physical therapist assistant for Kinetic Edge. Marcy’s mission is to provide compassionate care while improving the quality of life of our clients. Marcy attended Indian Hills Community College to become a physical therapist assistant. Marcy is from Bloomfield, Iowa. In her free time, she enjoys going to flea markets, camping and spending time with her husband, Eddie, their daughters, Skylar, Courtney, Marissa, along with their two cats, Bucky and Cassie, and their two dogs, Chloe and Cash. Beth Shilling is the care coordinator for the Centerville clinic. Beth answers the phones, welcomes clients into the office, helps with insurance questions, does scheduling, and pitches in with whatever else is needed! Her mission at Kinetic Edge is to make everyone’s experience the best possible. Beth earned her associates degree from Indian Hills Community College. She and her husband, Nate, live in Centerville with their kids, Owen, Kate, Rylee, Cole, and their two cats, Paisley and Charley.